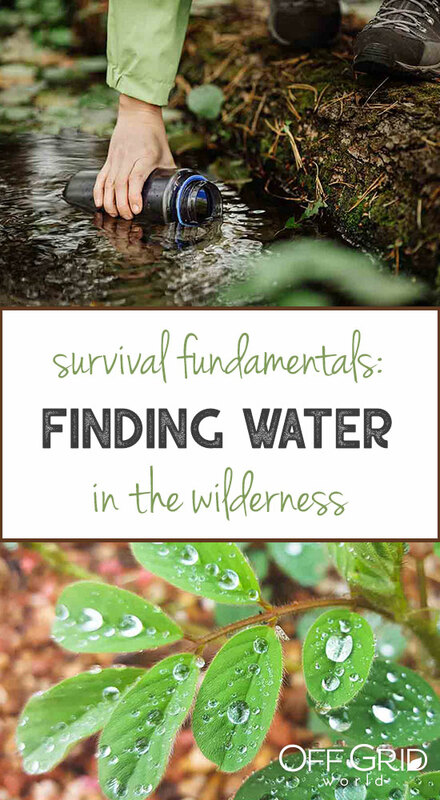 In part one of our survival fundamentals series, we discussed the rule of 3 and how to find and purify water in the wilderness. Once you have your water situation squared away, it’s time to think about your source of survival food. When you are without food your cognitive abilities suffer, and that means your ability to make sound decisions will decrease, leaving you prone to accidents. Due to the ethics involved, it’s impossible to create a proper study in order to find out just exactly how long the human body can go without food before death. However, in a study present in the British Medical Journal, it was pointed out that in modern day hunger strikes, these strikes had to be halted after 21 to 40 days due to risk of death. When you are in the process of starvation, your body will begin to cannibalize itself. Usually, after 8 hours it begins to eat up the remaining glucose in your body. When your glucose supply is consumed, your body begins to feed on its amino acids, which translates to eating its own muscle tissue. To curb its consumption of muscle mass, it will rely more on consuming fat. Euell Gibbons brought forging for wild vegetation to the forefront, when he began introducing his methods of seeking, testing and eating wild vegetation to the masses in the 1960’s. As a result, the public began to realize that the wilderness was not a thing to be feared. In short, it’s not hard to be a forager. In fact, it’s actually en vogue at the moment. All that’s needed is to take a good look around. For instance, did you know that you can actually eat the leaves of birch, beech, linden, hawthorne and spruce trees? Well, you can. 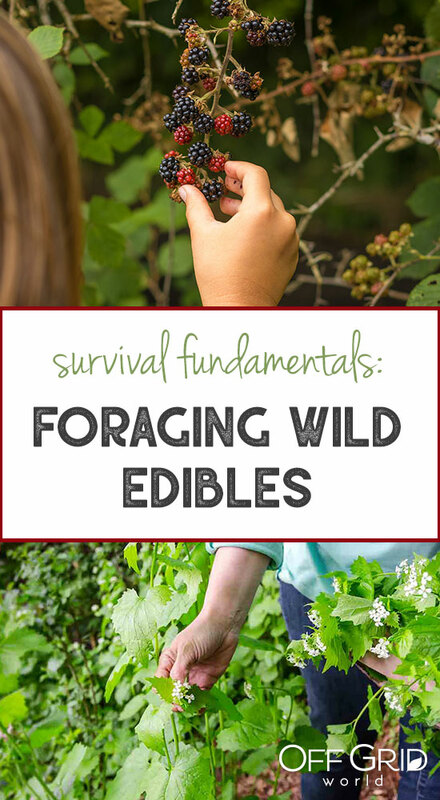 With that being said, it’s time to give you a heads up on the best wild edibles in the wilderness. We’ll begin by sharing with you the plant species you are already familiar with, such as dandelions, cattails, and clover. Since this is about survival, we’ll also include any medicinal benefits that each plant has to offer, if any. 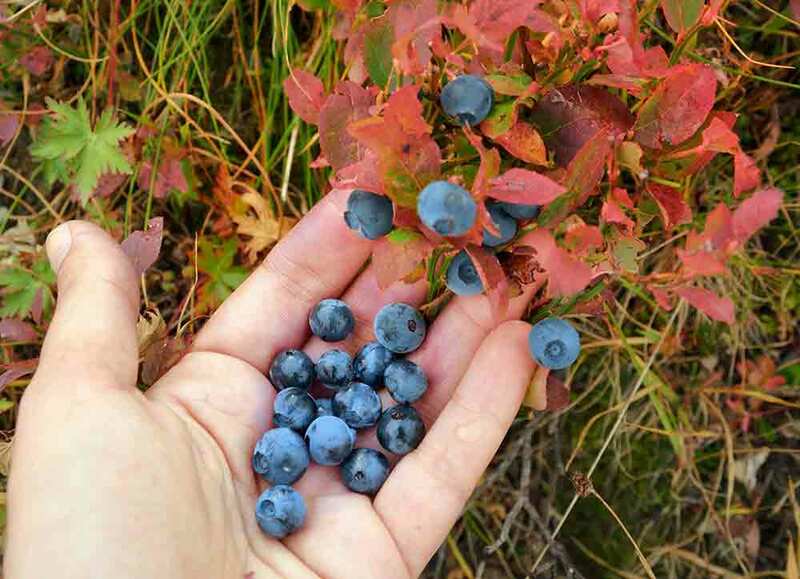 We strongly encourage you to take note of the medicinal benefits, along with the nutritional benefits of each plant, and plan on setting some aside for your wilderness medicine chest, so they’ll be readily available should the need arise. Note: always take extreme caution before consuming any plant you forage. Be absolutely sure you know what it is. Even experienced foragers have succumbed to death after eating misidentified plants. 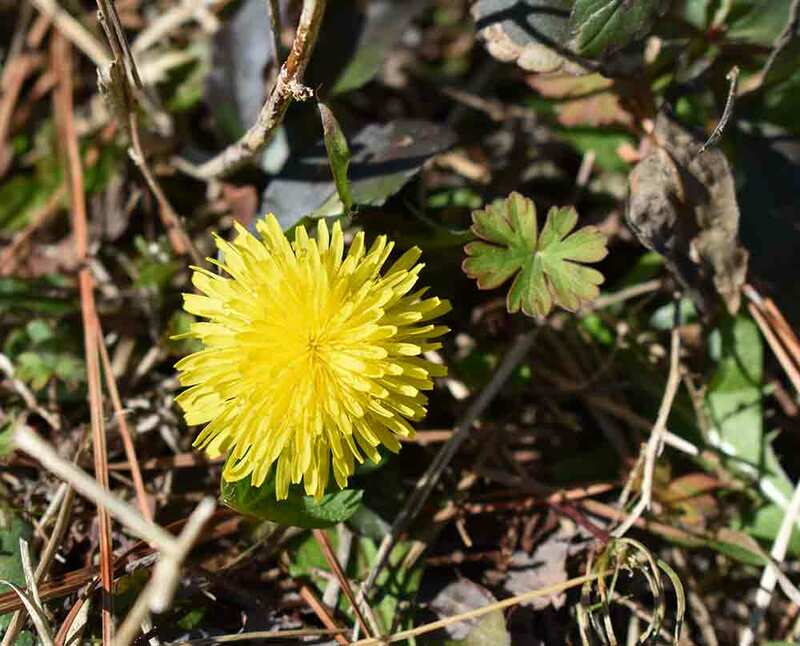 As far as wilderness survival foods go, you can’t do better than the everyday dandelion. You know this sometimes fuzzy, sometimes yellow blossom. The common dandelion flourishes just about everywhere. While this plant is usually considered a menace for lawn addicts, it is an absolute treasure to those lost in the wilderness, as it is nutrient dense. 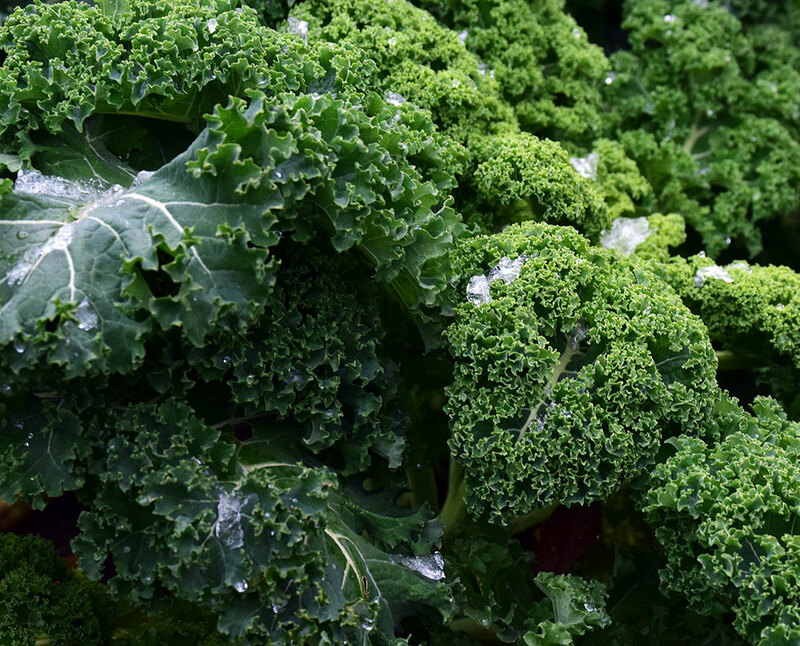 Known to be high in protein, vitamins A and C, as well as providing you with calcium and iron, this mineral rich plant is entirely edible. This means you can feast on the leaves, flowers, and roots. Dandelion also is important for its medicinal properties. 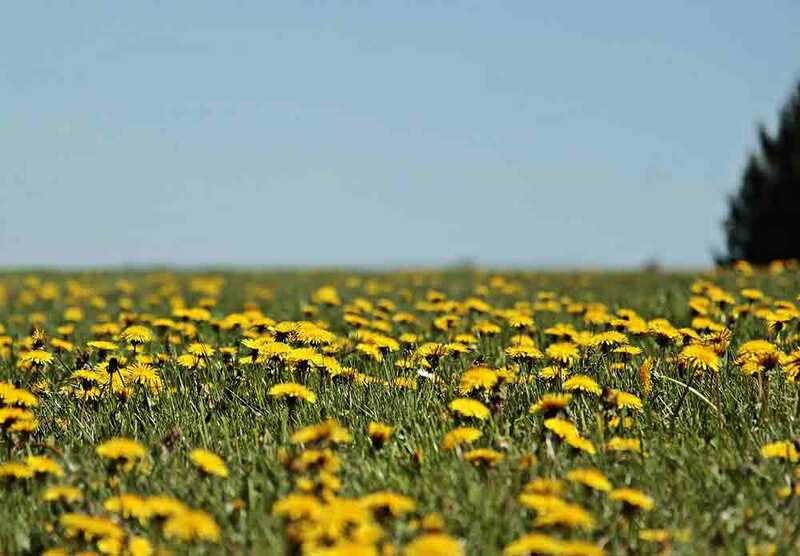 Like the humble plantain, the dandelion assists with relieving digestion issues. Also, don’t be too quick to toss those milky stems away. It turns out that the milk you see in dandelion stems is very useful when it comes to soothing skin irritations due to its germicidal and fungicidal abilities. 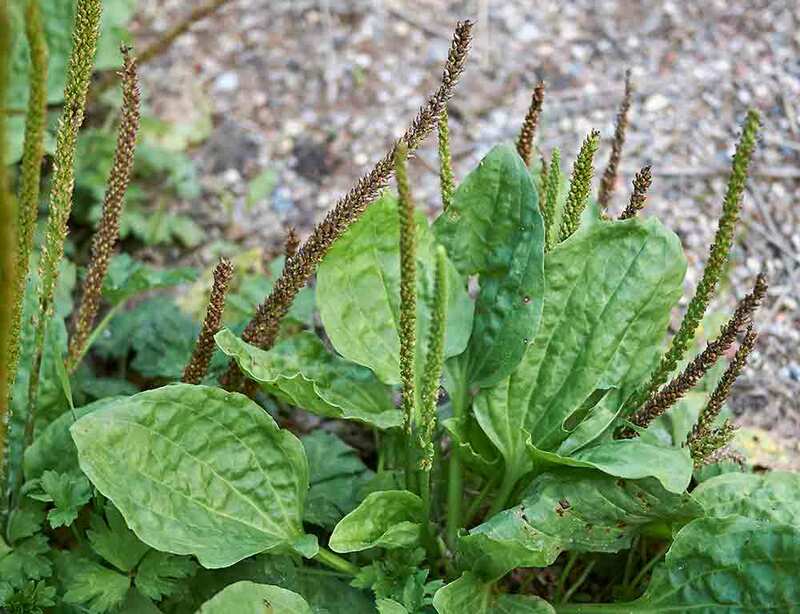 If you find yourself in a survival situation, see if you can locate the plantain weed as soon as possible, as this is a great and easily accessible survival food. 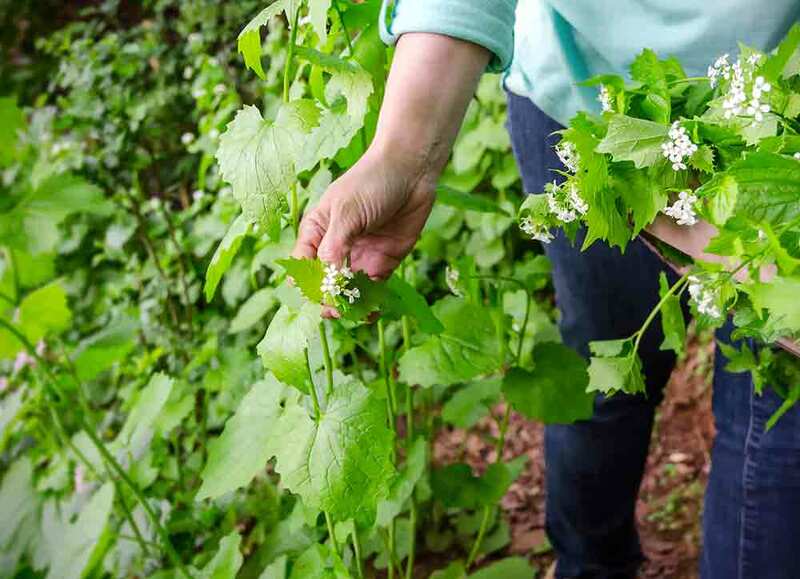 You’ve likely seen this familiar backyard weed many times, and probably never realized that these are one of the healthiest plants to eat. One of the main reasons you want to locate this weed, in addition to its nutritional value and abundance, is for the fact that it’s excellent when it comes to treating diarrhea and other stomach issues. This is crucial when foraging in the wild, as you may drink contaminated water or accidentally ingest part of a plant that will make you ill. The leaves of this antimicrobial, anti-inflammatory plant are also useful as a treatment for skin irritations and flesh wounds due to the abundance of aucubin and allantoin in the plant. If you happen to come in contact with poison oak, poison ivy, or sumac, apply plantain leaves to the irritated skin immediately. This tough weed is a staunch foe to most gardeners. That being said, it is also commonplace, and easy to locate, as it’s usually adorned with tiny little white flowers. The leaves are the edible part of the plant. Once you’ve collected enough leaves to eat, remember to add some to your wilderness medicine chest, along with plantains and dandelions. The yarrow can be chewed, applied to wounds, and ingested to relieve stomach issues. In fact, this often overlooked plant was used to treat and dress wounds on the battlefield in decades past, so you’ll definitely want to keep some handy in case you cut yourself. 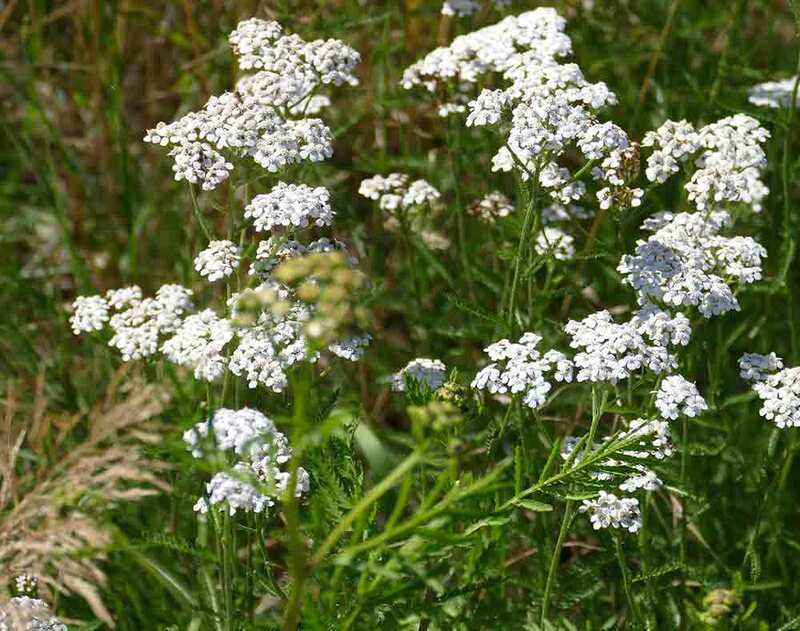 Finally, if you’re a woman, yarrow has also been used to relieve menstrual cramps, which could prove useful. 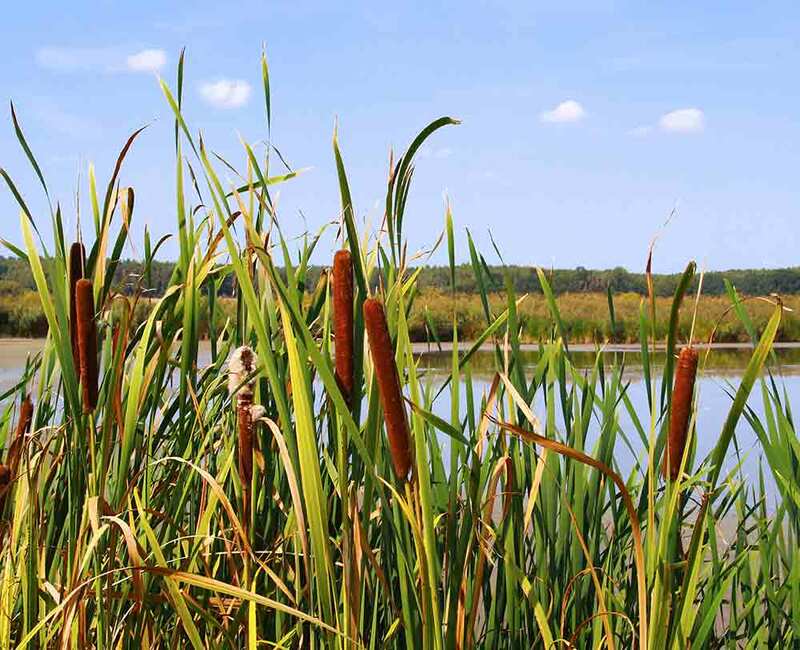 Most of us are familiar with cattails alongside ponds and in our fall floral arrangements, but did you know you can actually eat them? Simply peel the shoots, or munch on the flower heads for fiber, vitamins B6 and K, along with iron. Another benefit of cattails: they grow near water. Cattails grow from 3 to 10 feet in height, so they’re easy to spot when you’re out foraging. So, if you locate this wetland plant, you not only have a food source, but you’ll also have water as well. But that’s not all. Take a look near the younger leaves for what they call, “cattail jelly”. This jelly has been used both internally and externally to reduce inflammation and pain. There are probably more than a few of you out there who used to munch on these as kids. 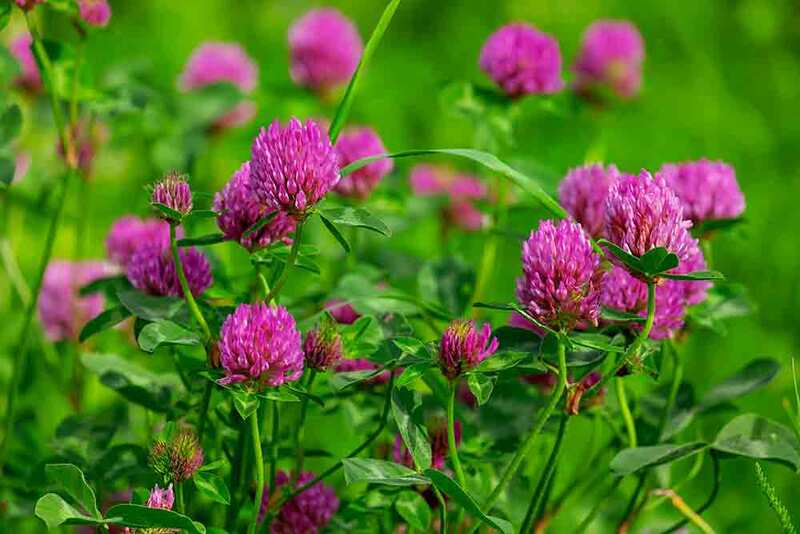 We’re talking about the flowers found on that superb wilderness survival food – red clover. Just pop the reddish-purple flowers off and eat. They have a rather pleasant, sweet taste to them. 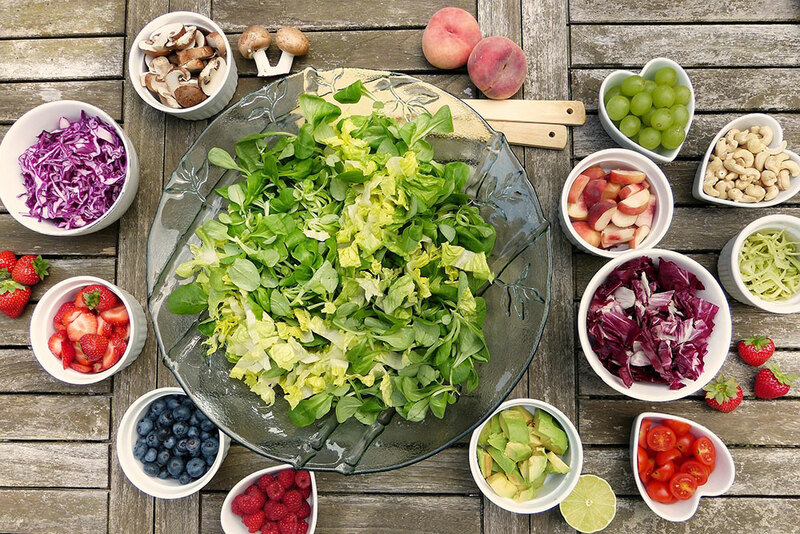 These nutrient dense creations are considered extremely healthy to eat. However, the wrong berries can make you incredibly sick. 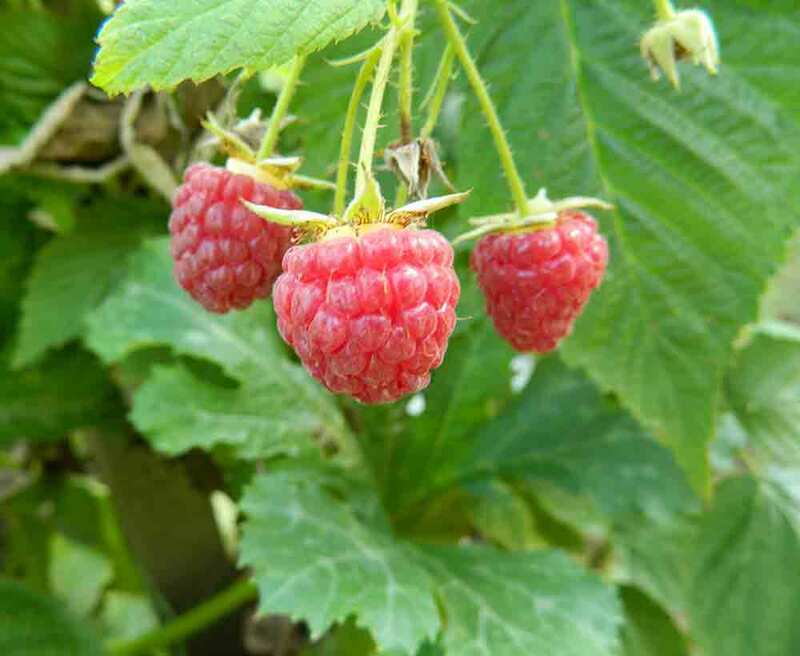 According to celebrated botanist, Andrew Townesmith, it’s critical to only select berries that you are familiar with, such as blackberries and raspberries. Under no circumstances should you even try berries that are white or yellow in color. Also, please avoid foraging plants from roadsides, as these plants have most likely been sprayed with dangerous herbicides and/or pesticides. Survivalist experts suggest that unless you are quite knowledgeable of the local, edible plant life, to always test each and every plant, whether it looks familiar to you or not. Keep in mind that when survival eating, plants often look alike to the inexperienced traveler. What you may think as a harmless plant, could actually be hemlock (deadly), so take extreme care. There are close to 800 known species of poisonous plants found throughout the United States. This makes it incredibly difficult to know which ones to eat, unless you are a survivalist, prepper, or botanist. In such cases, one should utilize the Universal Edibility Test. When it comes to plants and edibility, they can be somewhat tricky. Some plants, like the dandelion, can be eating in their entirety – flowers, leaves, and roots. However, other plants are not so nice. Many plants have both poisonous parts and edible parts, while some are only edible during certain seasons. As a result, you can see the need for some sort of method to detect edibility of survival foods in the wild, and that is the Universal Edibility Test. Here, you’ll be taking each part of the plant, and tasting a small bit, then wait for 24 hours. This is time consuming, so don’t waste a moment. Only look for plants that are present in great numbers. Forgo eating or drinking for 8 hours. As some insects are unhealthy, you do not want them interfering with the test, so check each section, removing any insect life before testing. Only eat fresh flora, while avoiding any rotted parts. Time to rub the plant on your skin. If you have a reaction, then do not eat the plant. This is known as the contact test. Smash only one part of the plant at a time, such as the leaves. Rub it into the crux of your elbow, much like the process people use to test hair dye. Continue rubbing for 15 minutes, then wait patiently for 8 hours. During these 8 hours, you may drink plain water, but cannot consume any foods, as they may interfere with your test results. If you do not experiences redness, welts, burning or a rash, move to Step 5. If you can boil the plant, do so. If you cannot, then test it raw. Either way, take the plant and hold it up to your lips for 3 minutes. If the plant gives your lips an unpleasant feeling or reaction, then discard that part, and label it unfit for consumption. Begin the process with a new section, such as the roots. If no reaction, move on to Step 6. Take that bit that was pressed up against your lips, and place it onto your tongue for 15 minutes. If you feel any irritation whatsoever, remove it and rinse out your mouth with plain water. Remove taste prejudices here. In other words, just because it tastes terrible does not mean it’s bad for you. However, if it burns or tingles, it is. If it sat on your tongue for 15 minutes and you notice no untoward effects, it’s time to start chewing. Again, you’re going to chew for a straight 15 minutes. Do not attempt to swallow yet. If you feel no unpleasant sensations, you’re good. If you do, remove the plant and rinse with plain water. If everything is fine, then it’s time to swallow. Again, you’re going to wait for around 8 hours. Do not eat anything, as that will interfere with the integrity of the test results. You can drink plain water. If you feel sick, then induce vomiting. If you feel alright, then move to the next step. Time to take a mouthful, so place approximately 1/4 cup of the plant in your mouth, chew and swallow. Wait another 8 hours. If you’ve made it this far? Congratulations! You’ve just found a plant you can eat. As you can see from the above, the Universal Edibility Test is a rather lengthy process, so it will pay great dividends if you get to know the edible plants available to you by sight. It will increase your chances of survival and cut down on the physical exertion required by foraging. Dan Patrick loves being active outdoors. Both prepping and exploring the great outdoors has been a lifestyle choice from an early age. Dan was taken on hiking and wilderness trails by his father from the age of five. Writing about his survival knowledge has become a passion too. You can read more about this at https://survivaldan.com. 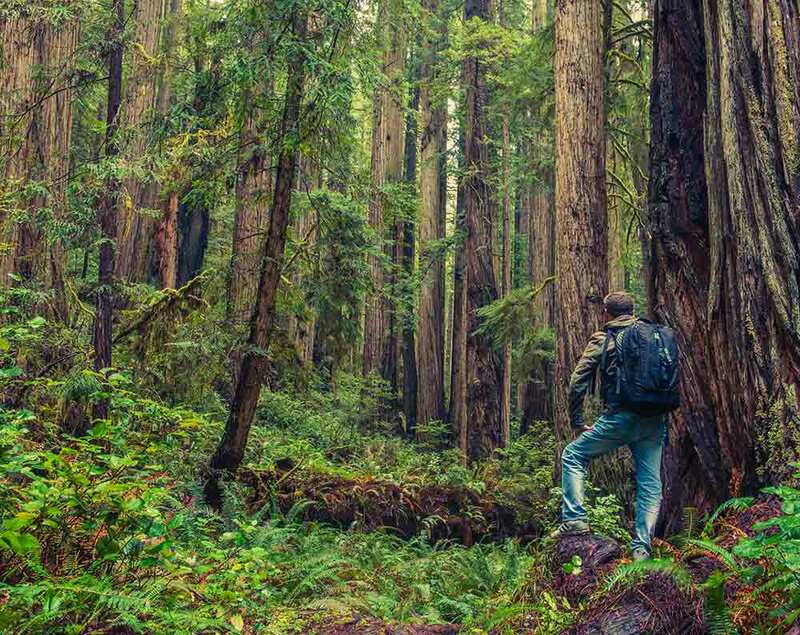 According to a study by the Wilderness Medical Society, 78,488 individuals became lost in the wilderness between the 1992 and 2007. 2,659 died, 24,288 were injured, and 13,212 were saved. This boils down to 11.2 incidents per day. As you can see by these numbers, this type of statistic happens all too often, and is usually due to individuals venturing into the wilderness without preparation. However, these numbers only reflect on individuals lost in the wild. 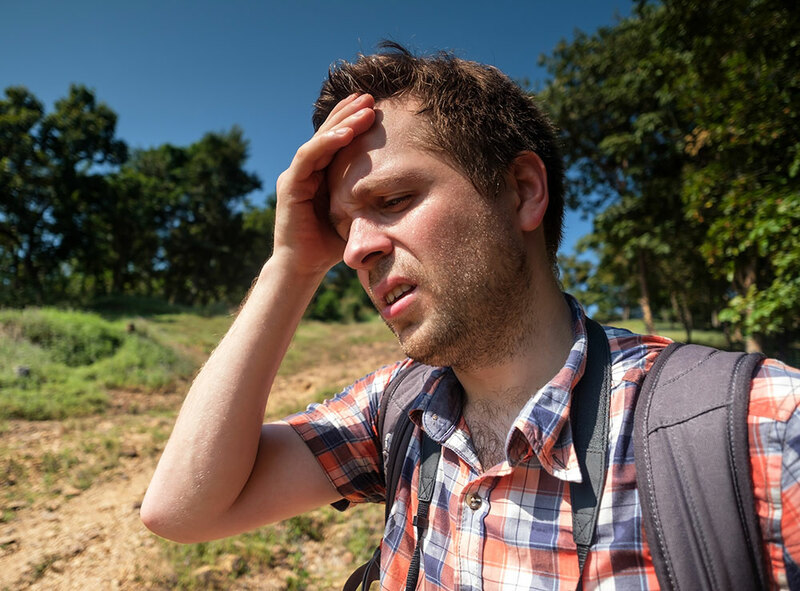 There are plenty of cases where people find themselves stranded that do not involve becoming disoriented and lost during an excursion into the woods. For instance, you could be driving your regular, daily commute through a forest preserve during a light snow. Soon, that light snow transforms into a blizzard, and you find yourself in a ditch. You could also go out for a day on the ocean, only to end up shipwrecked on an island. Whatever befalls you, as long as you are properly prepared with both knowledge and supplies, you should be able to survive. 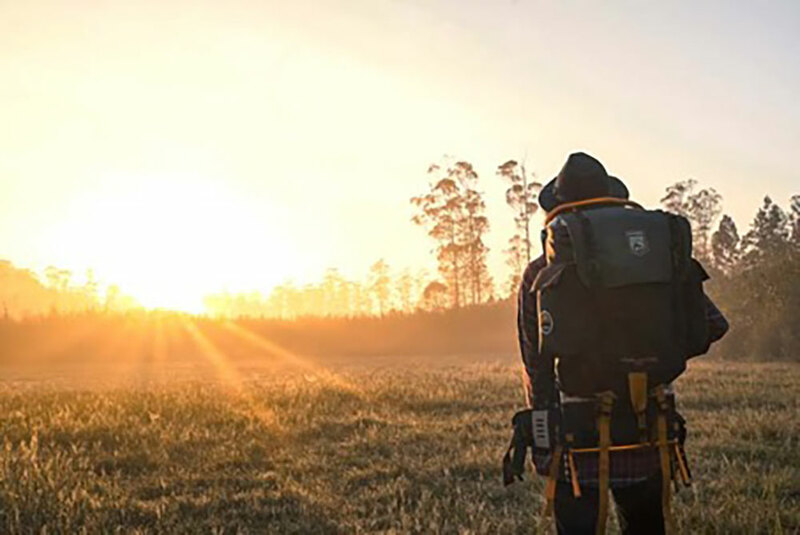 As with all things, when it comes to surviving while stranded, one must begin with the basics, and this means knowing what is necessary to maintain your existence. For this, we start with the Rule of 3. The Rule of 3 is a simple way to remember what is truly important and help you to prioritize your activities for optimal survival in an efficient manner with the least energy expenditure. The Rule of 3 helps you to keep your head, not panic, and center on what it is that must be done, in the order which ensures survival. 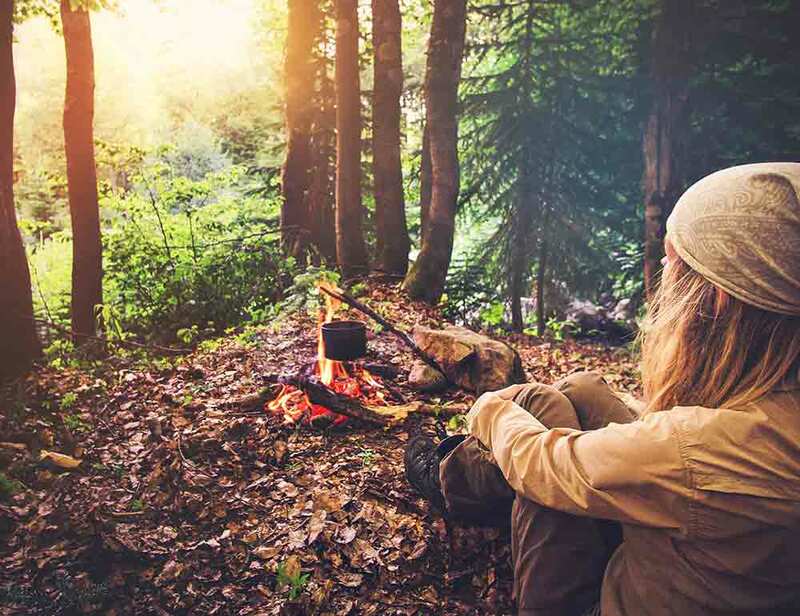 In short, armed with the knowledge and ability, you can make the wilderness your friend, one that will feed you, quench your thirst, keep you warm, and give you shelter. As stated, many people simply do not plan well enough ahead of time. They may assume that their hike will only last a few hours, and they’ll make it back in plenty of time for dinner. As such, they leave the compass at home, take only a few bottles of water, and leave nutrition on the kitchen counter top. It’s assumptions like these that get adventurers in trouble. 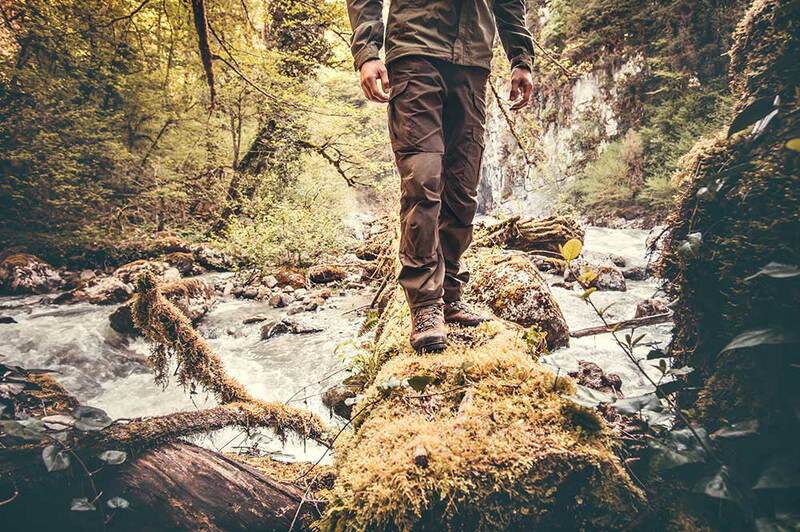 Whether you are a seasoned hiker or a weekend warrior, when you enter the wilderness, anything can happen, so you must be prepared. That includes knowing how to find water and edible plant life. Did you know that your body loses water as you breathe? It’s true. It also loses valuable moisture via sweating, digesting food, and excreting waste. Your body is made up of two-thirds water. Water serves to lubricate, regulate your body’s temperature, move toxins out of your body, as well as assist in digesting food. In fact, no matter how healthy you are, your body cannot last more than 3 days, at most, without water. In normal, everyday life, our body requires at least 2 quarts of water every day. Consider the outdoors. If you’re lost, you’ll be exhausted simply looking for food and building shelter, not to mention losing water by sweating under the sun, or moisture being taken via the dry air if it’s winter. In fact, dehydration can begin as soon as 6 hours without water. When your body experiences dehydration, it means that you lose more water than you consume. According to recent research, experiencing just 1 percent dehydration will begin to have a negative effect on your cognitive and physical performance. When dehydrated, your brain loses valuable moisture and the cells begin to shrink, your blood becomes thicker, and your kidneys do what they can to hold onto what little water there is. As a result, your concentrated blood makes your heart work harder, urination slows, and risk of losing consciousness occurs. In the wilderness, you’ll need to conserve your water. This means you should not exert yourself in the sun; save your activities until dusk or dawn to prevent fluid loss from perspiration. If you accidentally drink contaminated water, or eat vegetation which causes you to vomit or experience diarrhea, you’ll also be at risk. Now that you’re familiar with dehydration, it’s time to take a look at how to avoid it. Being aware of the Rule of 3 is important, but it is not enough. You also need to correctly prioritize your activities in order to achieve optimal survival. Most people would naturally consider going for a food source first, but this should not be the first priority. Nourishment is a necessity. 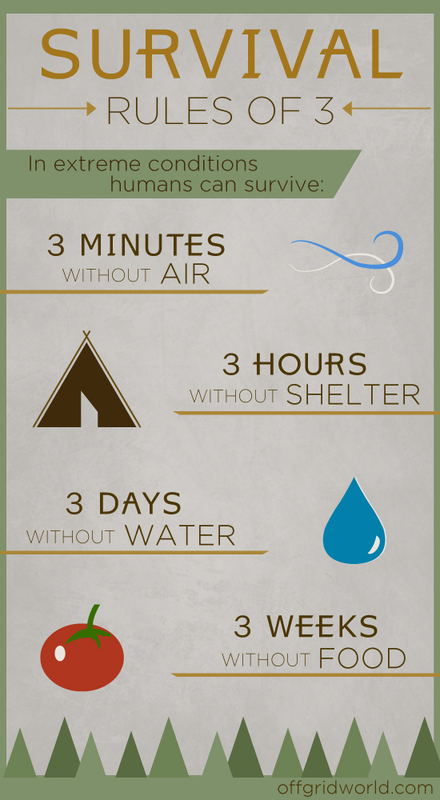 However, when you’re in the wilderness, remember the important order of operations: Water, shelter, food. We can’t live more than 3 days without water, and if the elements are unpleasant, you’ll need some type of shelter to help regulate your body temperature. So, first things first, and that involves location a viable water source. When it comes to finding a water source, a running stream of fresh water is your best bet. Next is water from lakes and ponds. This water is less desirable, as it is a natural breeding ground for harmful microorganisms. If neither are in your immediate vicinity, you’ll need to locate them. First, keep in mind that life gathers around a watering source. 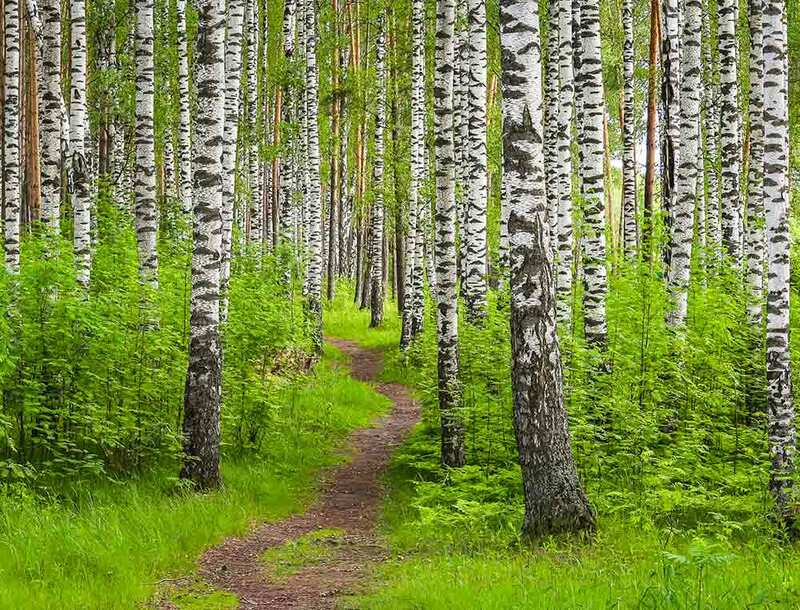 So, look for areas with thick vegetation, swarms of insects, or follow any animal tracks. When searching for water, keep an eye out for emergent plants. These will include willow and sycamore trees, cattails, and reeds. As you continue, periodically observe the sky, as birds will flock towards a water source usually at dawn and early evening. Take periodic rests, listening for the sound of frogs or water fowl. Unless you are able to boil or distill your water, stay clear of beaver dams, as beavers encourage Giardia. No matter what you see survivalists do on TV or in the movies, please refrain from drinking directly from these waters unless you purify the water first. 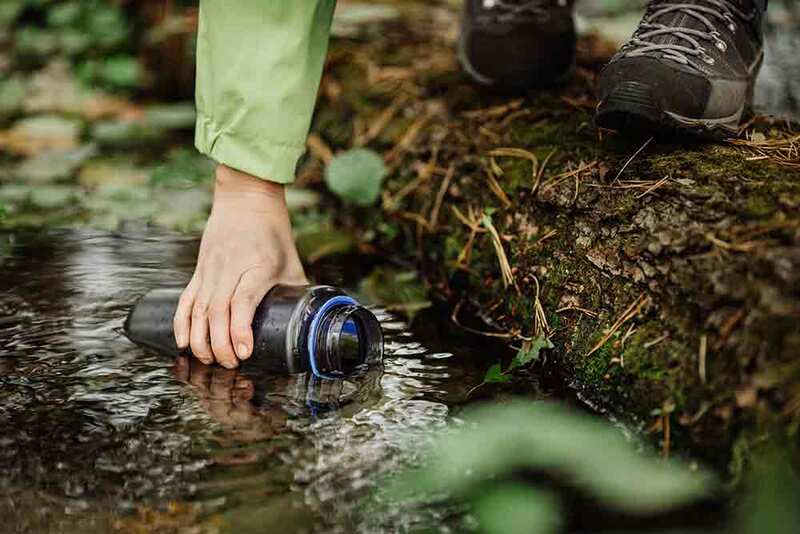 When you find your water source, it’s crucial to place a bit of fabric over the mouth of your bottle or canteen before you immerse it in the water. This acts as a filter which prevents sediment and insect larvae from entering your vessel. Rain water is the freshest water in the wilderness. As soon as it begins to rain, go and set out as many clean containers that you can. If you have plastic bags, a raincoat, or tarp you can create a small lake. Simply dig a shallow hole and place your bags, raincoat or tarp inside, and proceed to collect the water. 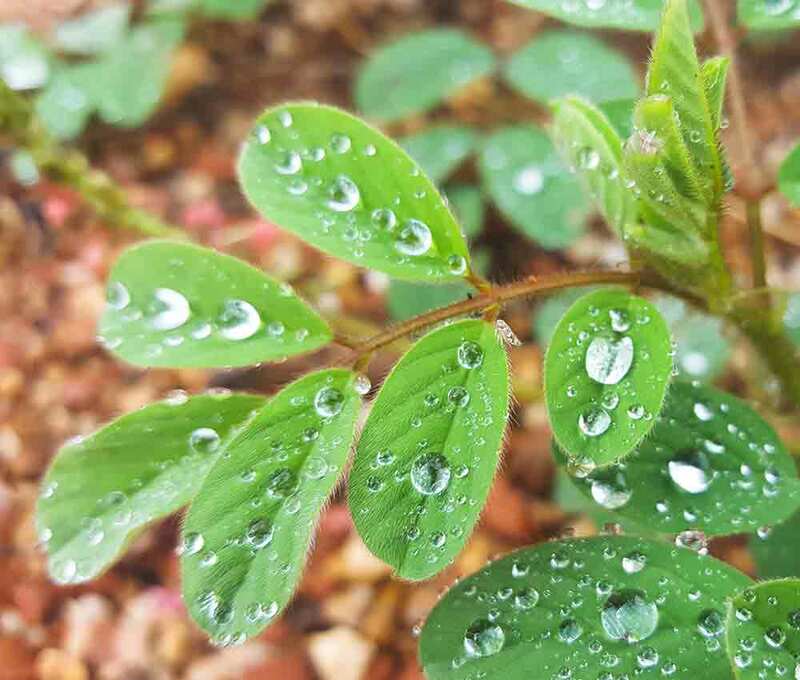 As for the morning dew, unless you are plant savvy, it might not be wise to go and lick it off leaves or branches. Many plants are poisonous and to do so could make you seriously ill. Instead, look for morning dew on grassy areas or rocks. Take a T-shirt, or other absorbent material, and begin to wipe up the dew. Once the fabric is filled, wring it into a container. Unless it’s frozen sea water, snow and ice are an excellent choice to stay hydrated. However, keep in mind not to eat the snow or ice without first warming it, as it can dangerously lower your body temperature and put you at risk of hypothermia. Solar stills are a great way to source water, and if you have the supplies, you can make one. First, remember that since you’ll be digging a hole, perform this activity at dusk or early dawn. Begin by digging a hole deep enough to hold your container. Next, take a tarp, or plastic bag, and cover the hole. Secure the covering using rocks, large logs, whatever you have to keep the plastic tight. Puncture a hole in the middle of the plastic, right above the containers opening. finally, place a small rock near the hole. This creates a dip in the plastic. When the sun beats down on the earth, the dirt will begin to sweat. The water will condense on the underside of the plastic and drip into the container. 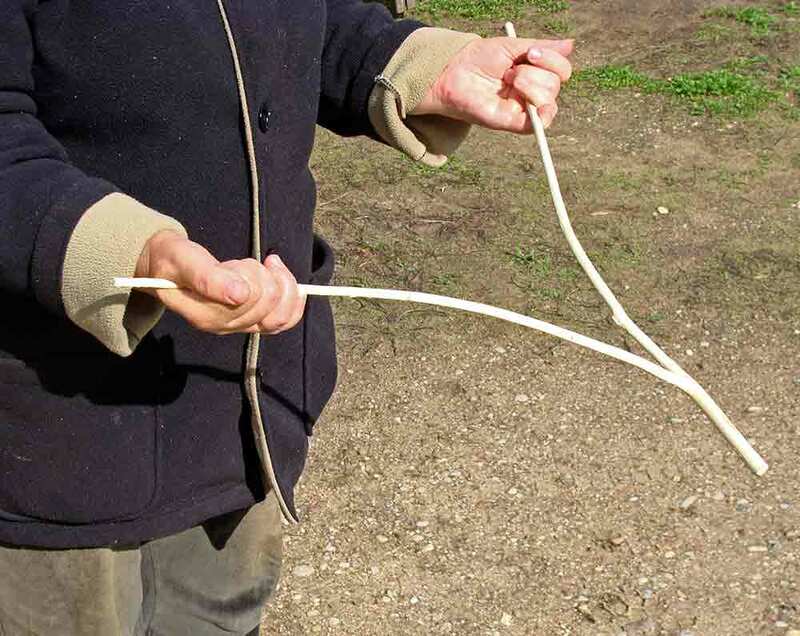 Dowsing is a technique for locating underground water. It was first used in 16th century Germany, and is still in use today. While some find great success with it, others do not. Skeptics and researchers such as the Amazing Randi have come to the conclusion that the results are based on pure chance. However, though not an exact science, when you are stranded in the wilderness, it’s smart to use any trick you can to survive. To begin dowsing, look for a forked branch from a bush or tree, and remove all leaves and unnecessary twigs. This is called the “Y-Rod”. Hold the two ends in each hand, with the stem pointing outward from your body. As you forage for food, and search for water, pay attention to the rod. If the rod dips downward, there is a chance you’ve located a water source, or are nearing one. Dowsing is considered a pseudoscience. However, it serves to keep the stranded individual occupied, and perhaps acts as a placebo effect, granting them a bit of hope. After all, one never knows. Urine – Despite the old tales of sailors surviving on urine, don’t do it. Urine is excreted from the body because it is composed of a waste product, and is also salty. 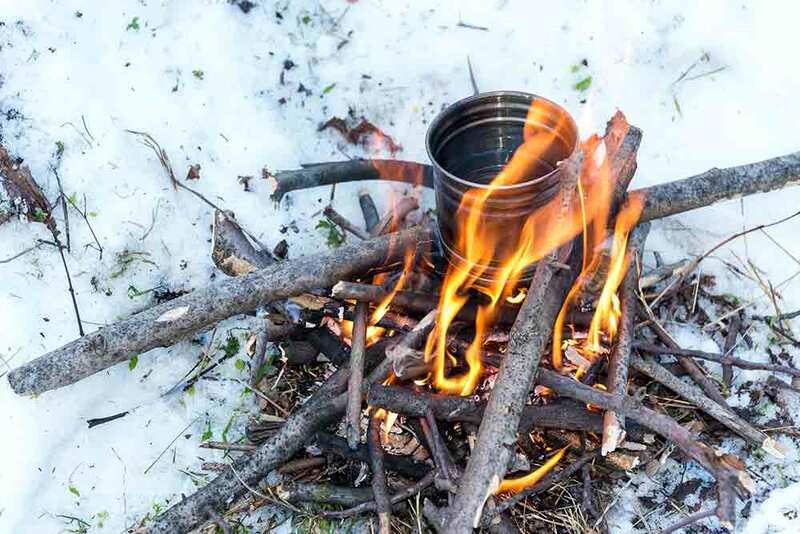 Alcohol – Say you went camping, and brought a bit of spirits for some late night camp-fire relaxation. Alcohol is fine under normal circumstances, but it causes dehydration and can make you tipsy, not a good combination when you’re trying to survive. It’s crucial to purify your water before you consume it. Wilderness water sources are teeming with microbes, animal feces, insect larvae, and sediment. To drink the water ‘as is’ puts you at risk of sickness and even death. 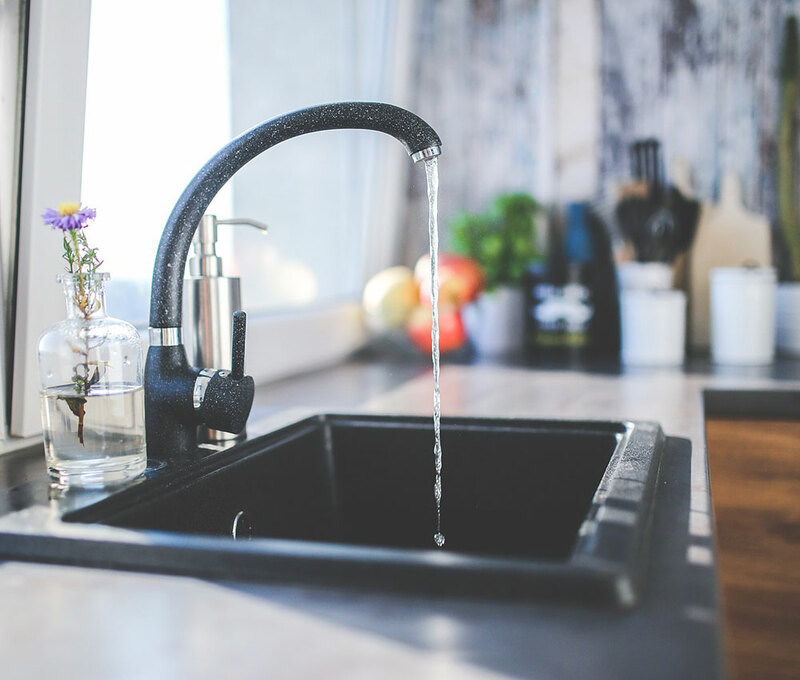 Below, we discuss a few common methods to purify your water, such as boiling, filtering, and chemical tablets. Cryptosporidium and giardia are two parasites which can survive chemical treatments, such as chlorine. In order to kill them, and most microorganisms, the EPA suggests putting the water to a full boil for 60 second if under 6,600 feet, and 3 minutes above 6,600 feet. While boiling your water kills microorganisms, it does not remove sediment. Sediment can still make you ill, so remember to filter your water before you boil it. 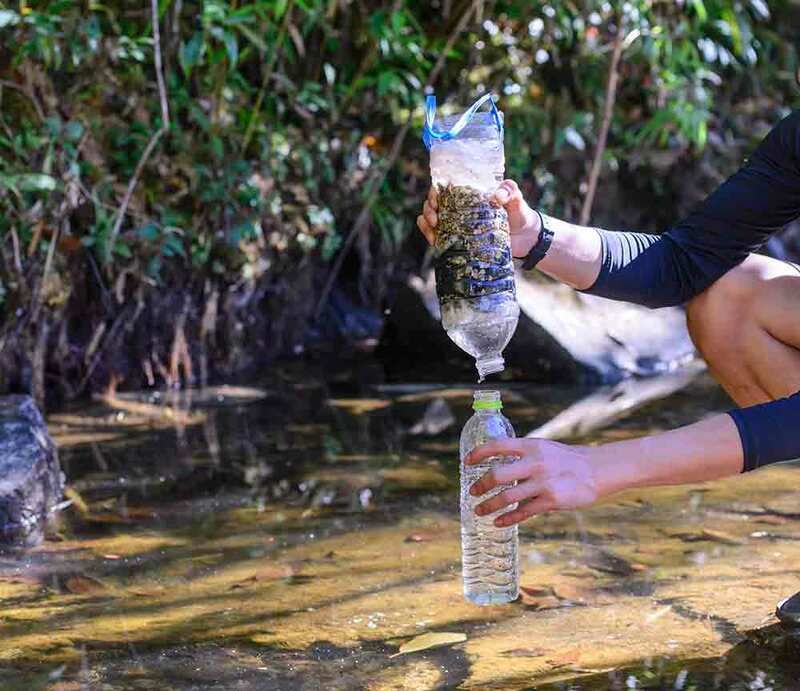 You can use your T-shirt to strain the unsafe sediments from your water. Water treatment tablets are available, but are not as effective as boiling. Not only that, water treatment tablets take a bit more time and do not kill Cryptosporidium or Giardia. Though not as effective as boiling, they are a convenient method to help purify your water. If you’re caught unawares, and have none of these methods available to you and are becoming rapidly dehydrated, then it’s better to risk becoming sick than to die of dehydration. If the water is muddy, wait until the dirt falls to the bottom, and use a piece of clothing to strain any other grit before you drink. Please do not drink from puddles in the road, as they will most likely contain dangerous chemicals. Before you set out, you can purchase a Steripen. This is a device which purifies your water via UV light. This UV light will kill bacteria and viruses. First, filter your water to rid it of nasty sediment, then you can proceed to purify it. You can also use the sun’s UV light to purify water. Many of us have had the pleasure of drinking sun tea, and this is basically the same thing. Simply take your water bottle, and leave it out to bask in the rays of the sun. One day is all it takes if it’s truly sunny, and two for overcast days. This has the same purifying effect on the water as the Steripen has. Once you have ensured you have a source of clean, drinkable water, you can focus on food. 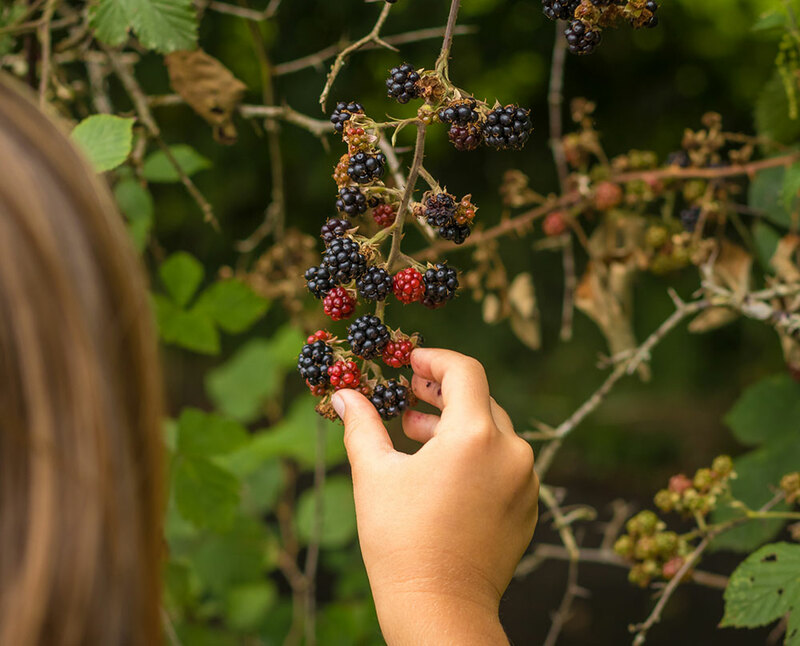 Finding wild edibles will be the topic of our next article, so stay tuned. 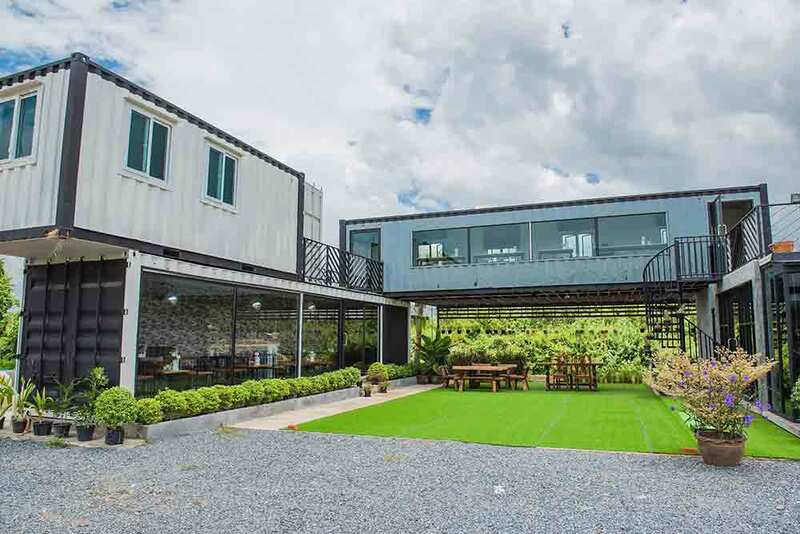 Shipping container homes are growing in popularity, as you probably know if you’re reading this. 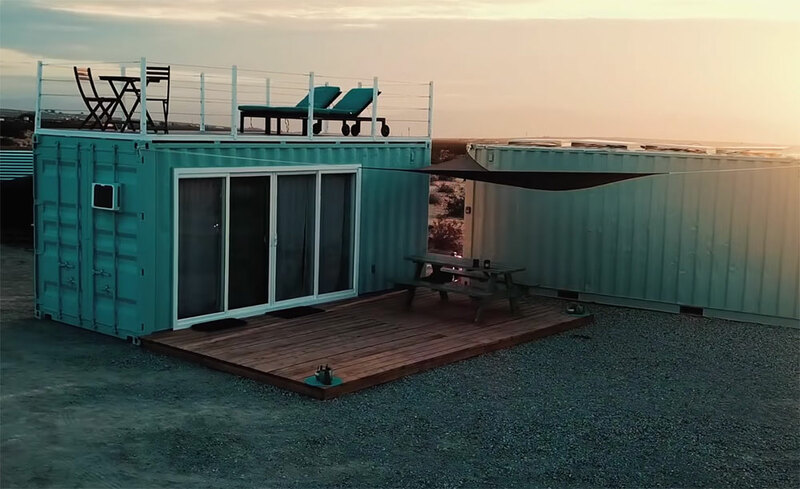 Homeowners love that shipping container homes are cheaper to build than traditional homes due to the inexpensive materials. Using containers makes construction faster, too. Containers have four walls, a ceiling, and a floor when they arrive. 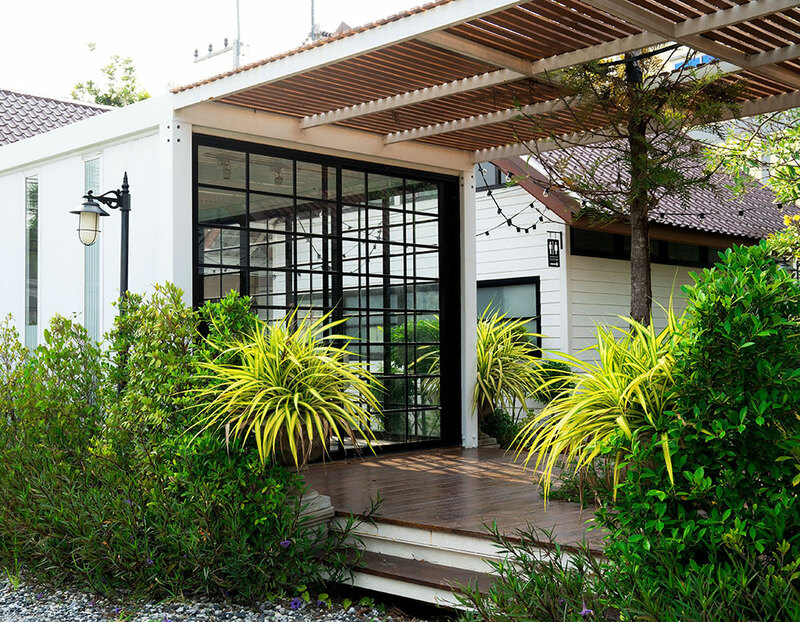 Instead of constructing a building from scratch, builders modify existing containers to fit the home. 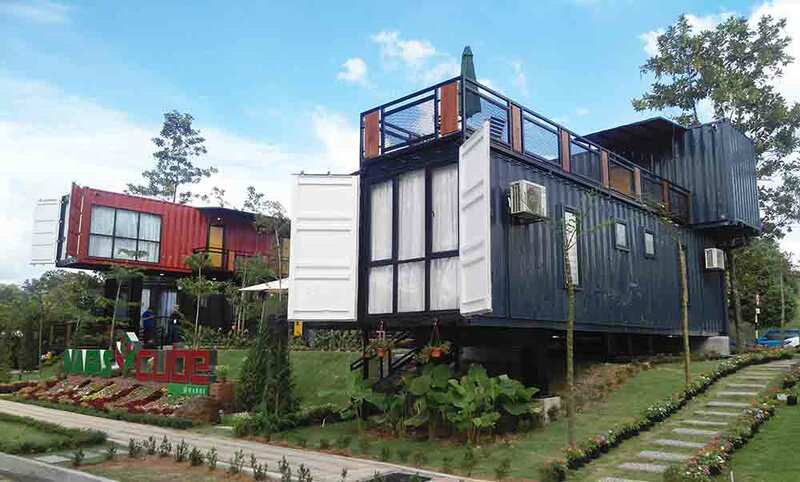 Shipping containers are eco-friendly, because fabricators use less energy to make them than standard building materials, and most homes are made with recycled shipping containers. Many people want to live off-grid, and these homes can make that possible in an affordable way. Not only do they reduce dependence on fossil fuels, but lower utility bills, too. 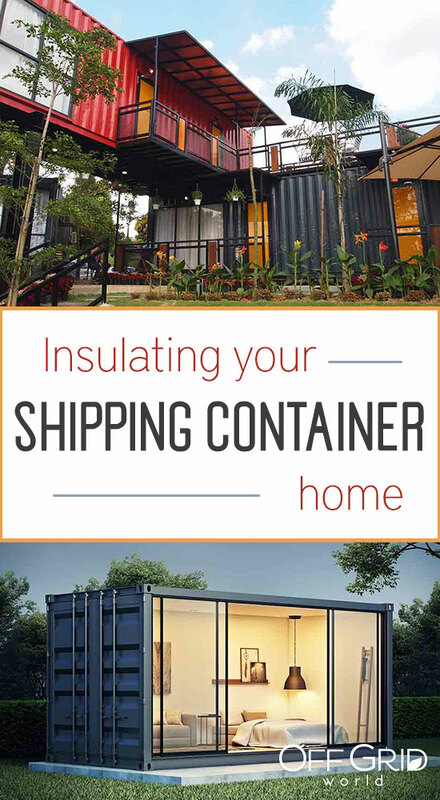 Shipping containers need insulation to make them livable. They bake in hot climates and freeze in cool climates because heat moves easily through steel. All your insulation decisions begin with the climate. Insulation keeps the outside weather outside and the inside temperature inside. The more extreme temperatures you face, the more insulation you need. If you’re building in a temperate climate, you may emphasize weatherproofing over insulation. People build shipping container homes in the Arctic and the tropics. Each climate requires varied materials, designs, and applications. Before you make any decisions about insulation, understand what you want it to do. Wet and dry climates create different problems for insulating homes, but wet climates can be the most dangerous to a steel home. Water can rust steel, destroying your home, so focus on keeping water away from steel. You also don’t want condensation from the steel destroying the interior of your home. 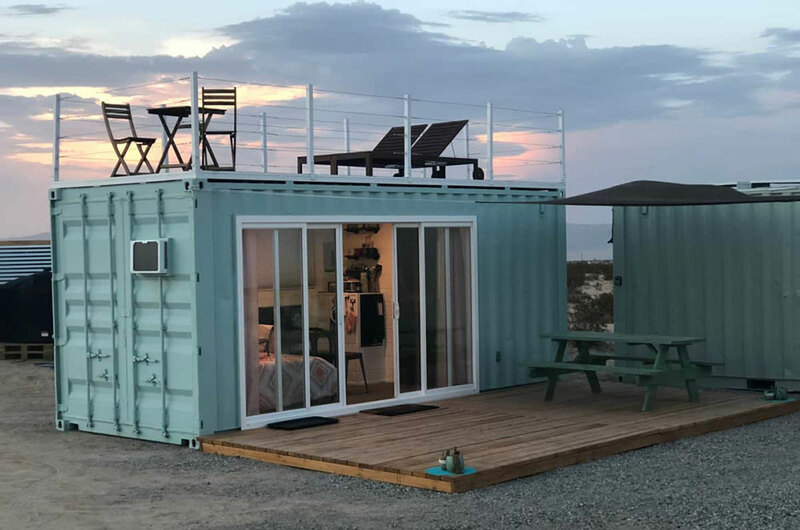 Shipping container homes are popular among DIY enthusiasts because shipping containers can reduce the need for skilled labor. Before you design your home, decide how much work you want to do yourself. A DIY home can cost less money, and you get the pride of constructing your own dwelling. Your building options may be limited by your skill. Contractors make construction move much faster. DIY workers often must learn skills throughout the construction process, often by streaming online videos. Contractors, though more expensive, already come with the skills they need. 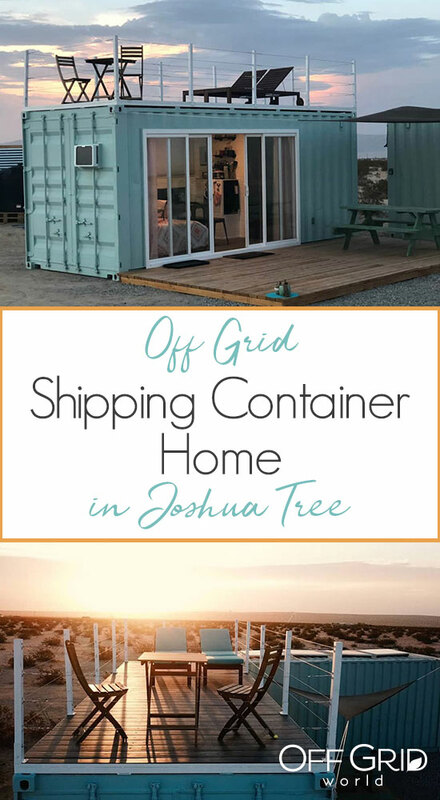 Shipping container construction works differently than traditional home construction, because of how steel boxes function in humid environments. The interior of a shipping container “sweats,” or water condenses. Water causes steel to rust, and your home will deteriorate much faster. It also can destroy any internal construction material like wood or drywall. You can create a vapor barrier in many ways. Some use wraps, like Tyvek, on the interior of the home. This method is the easiest to install, and it can be a DIY project. It does not, however, solve the problem of water condensation on steel. 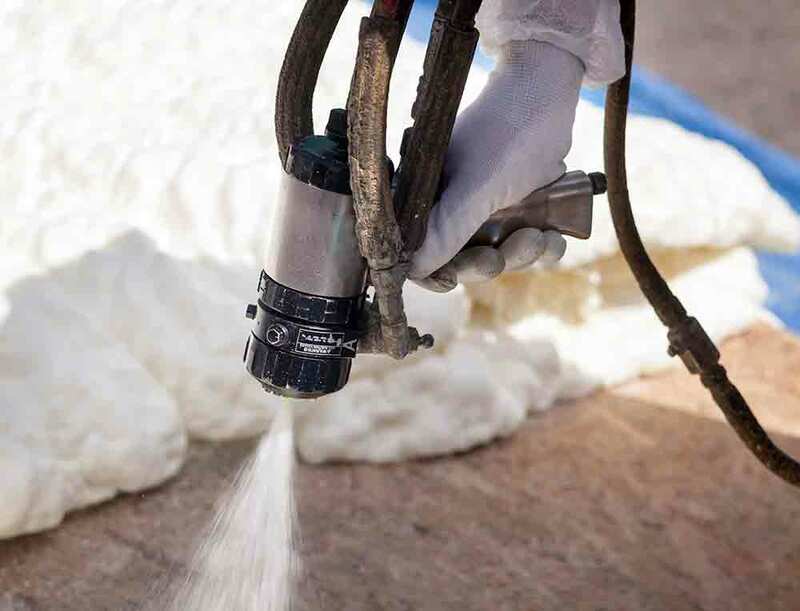 Spray foam creates a tight seal directly on the steel, but the chemicals are hazardous during application, so its application is not for amateurs. Heating and cooling both have different solutions beyond insulation. In the summer sun, a shipping container acts like a greenhouse. To keep the sun from affecting internal temperatures requires significant insulation unless you use a radiant barrier—material that reflects the heat. Homeowners often use special paints or reflective materials on the exterior of their shipping container. A rooftop garden, or living roof, also keeps out radiant heat in the summer, and it is beautiful, too. In a primarily cold climate, you want two things: draw in the sun’s radiant heat and prevent heat from leaving the home. Find a place with plenty of light and line the exterior of your home with material that is not reflective. Heat loss happens primarily in two places: your roof and your windows. One pane of glass can lose as much as ten times the heat as an insulated wall. The more window space you have, the more you will need to insulate your walls. Well-planned windows and a well-insulated roof will keep as much heat as possible inside your home. 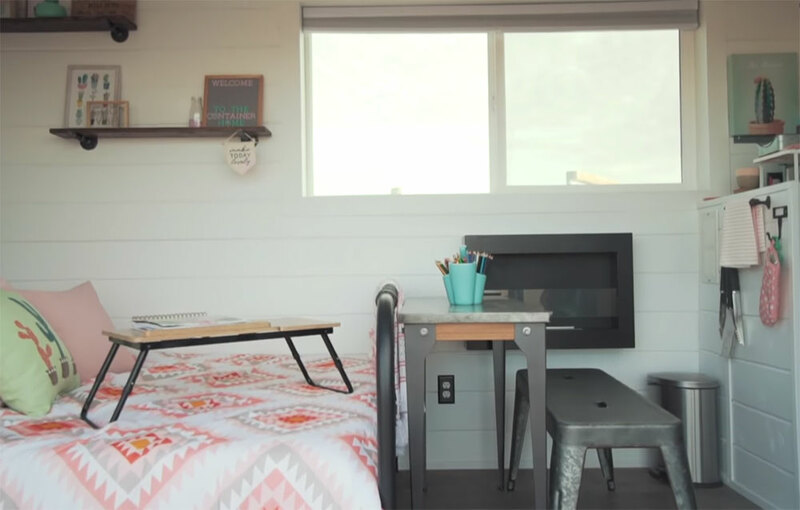 Many people build shipping container homes as three-season vacation homes. They use them when the weather is nice, in the spring, fall, and summer, but close them for winter. If you do not use your home in extreme temperatures, like a cold winter, you can design it with less heating or cooling power and less insulation. Surface area affects how much heat can leave or enter your shipping container home. The more surface area you have, the more insulation you need. The most efficient shape is one large square or rectangle because it minimizes the ratio between internal space and surface area. 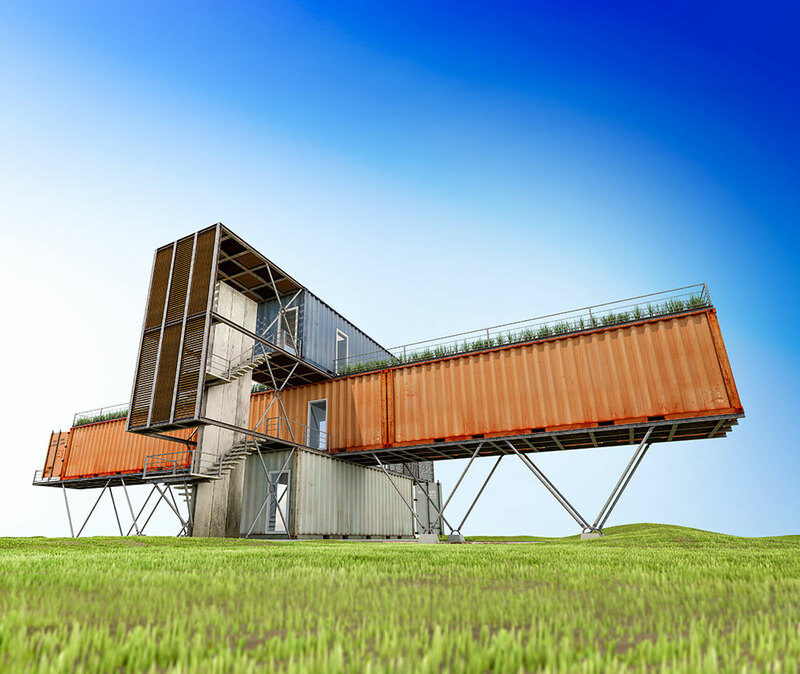 Some designers love to use shipping containers creatively, and they make homes in irregular shapes. The more irregular your home, the more insulation you will need. Many people construct shipping container homes because they want an environmentally friendly house. Shipping containers themselves are often recycled, but you can find insulation materials that are good for the environment, too. Some people choose natural materials for insulation. Indian homes are often lined with mud to keep out summer heat. Many homeowners choose renewable fibers like wool, cotton, or cellulose insulation made from recycled paper or cork. Natural or recycled insulation may not be as eco-friendly as initially advertised. Natural products like wool or cellulose are flammable, and they require added flame-retardant chemicals. They can also be less efficient insulators, too. If you want an environmentally friendly home, research the entire production process to ensure your eco-friendly insulation is safe as well as effective. 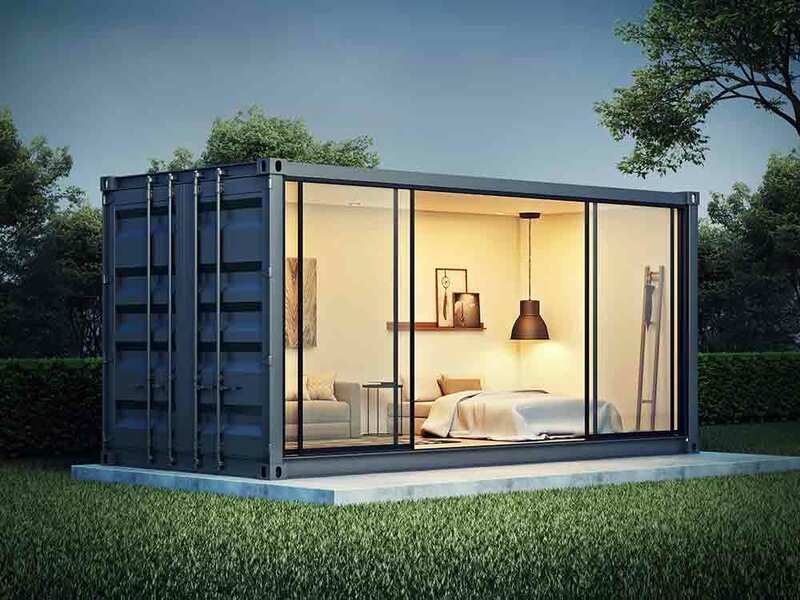 Shipping containers limit how much space you have because they come in specific sizes. Standard shipping containers are eight feet wide and eight and a half feet tall. Your insulation choices can decrease the amount of indoor space you have. When you install insulation inside your home, you need to build a gap between the interior walls and the steel, reducing your space by several inches along your walls, floor, and ceiling. Internal insulation, however, is often less expensive, and it is much easier to install. Exterior insulation maximizes your space, but it is also exposed to the elements. Exterior insulation requires more maintenance and needs to be replaced sooner. It can also be more expensive and require a contractor for installation. Because they are constructed from steel boxes, shipping container homes require different insulation solutions from traditional construction. When you design your new home, these factors will help you build the most efficient home. Making good decisions on insulation can keep your heating or cooling costs down and make your home environmentally friendly. You can most assuredly save money annually by switching to low-flow water fixtures such as faucets, toilets and showerheads. You’ll be able to spot a low-flow water fixture by its WaterSense label. If this is all new to you, and you don’t know where to begin, we suggest you check out the EPA’s WaterSense Calculator. This calculator will aid you in the type of fixture to choose for your particular needs. For instance, a toilet with the WaterSense label will save you around $90 or more each year alone according to the EPA, and if you purchase an inexpensive low-flow toilet for around $100, that toilet will basically pay for itself after one year. However, we know that not everyone currently has the budget to switch out their toilet for a more efficient model, but that shouldn’t stop you from saving money each time you flush. Simply place a brick in your tank. this causes water displacement which in turn, means less water used per each flush! Many older homes still have pre-1980’s toilets installed, so if you’d like more information on how installing a newer model can benefit, check out the EPA’s pamphlet, “Flush Fact Vs. Flush Fiction“. Next, you should consider having any and all leaky water fixtures, pipes and hot water tank repaired or replaced immediately. In fact, according to energy.gov savings, the simple process of heating our water is number two when it comes to energy expense. They also warn that a faucet or pipe that leaks one drop/second means you’ve wasted up to 1,661 gallons of water at a cost of $35 per year. When it comes to faucets and shower heads, the fix is extremely cost effective and simple. Many older homes have pre-1992 faucets and shower heads. To reduce your kitchen or bathroom flow rate, simply purchase and install an inexpensive aerator. This is a very simple procedure and will not require a plumber. These aerators will keep your kitchen faucet flow rate to 2.2 gpm or gallons per minute, and bathroom faucets to 1.5 to 0.5 gpm. Another way to save money on water is to only use your Energy Star Certified dish and clothes washers only when full. You can also save money on outside water usage by getting yourself a rain barrel or two to collect water from your downspouts to water your garden. If you can’t afford a rain barrel simply use an old rubbish container. Did you know that most dryers do not have an Energy Star Rating? That’s true, so if you have an older dryer, there are still a few things you can do to save some money. 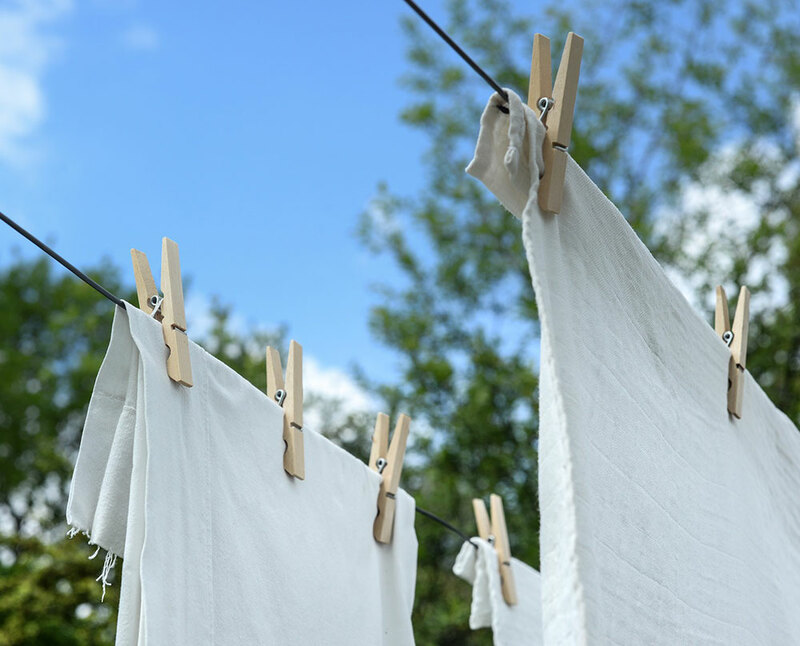 First, consider using an inexpensive drying rack or rig up a clothes line outside so your clothes can air dry. This will definitely save on energy costs. When it comes to the dryer itself, make sure that you keep it on a warm setting, and are right there to to put the next load in. This way, the dryer drum is still hot. Dry balls are a great addition to your drying cycle, as they keep your clothes separated during the drying process, while sopping up some extra moisture. By taking a few of the following tips under advisement, you’ll be able to save money on washing clothes as well. 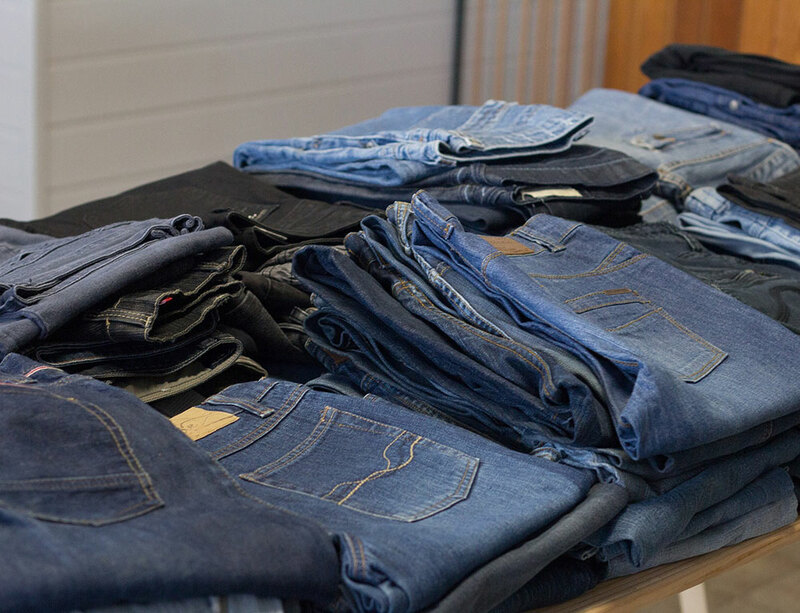 For instance, be sure to only wash when you have a full load, use cold water as much as possible to save on heating costs, and make sure that your laundry loads are the right size for your machine. To save money on dryer expenses, use the high-speed spin cycle on your washer, if you have it, to really drain your laundry of as much water as possible. According to an article in Money.usnew.com, the very act of temperature regulation can gnaw a huge chunk out of your pocketbook each month. Fortunately, you can gain some control over the situation by following a few basic, common sense tips. In the winter time, for instance, you can simply snuggle up in some nice, warm jammies, or daywear. At night, consider purchasing an inexpensive sleeping bag to use instead of a blanket. Sleeping bags are designed to be easy to maintain, and by zipping yourself up at night, you’ll be able to use your own body heat to help keep you warm as toast, so you can turn that thermostat down. Ceiling fans may be a surprise to you, but they actually increase air circulation through your home, and work for both summer and winter seasons, while closing off the doors of areas you don’t use frequently can help keep the air circulation and temperature right where you need it. Don’t forget that a properly maintained furnace will also reduce energy consumption as will insulating your attic. Other things, such as insulating your hot water tank and piping can save you much in the way of energy usage costs over the long run. Switching to LED lights will result in savings, as will applying new or fresh weather stripping to all of your windows and doors so the cold does not enter and the heat does not escape. 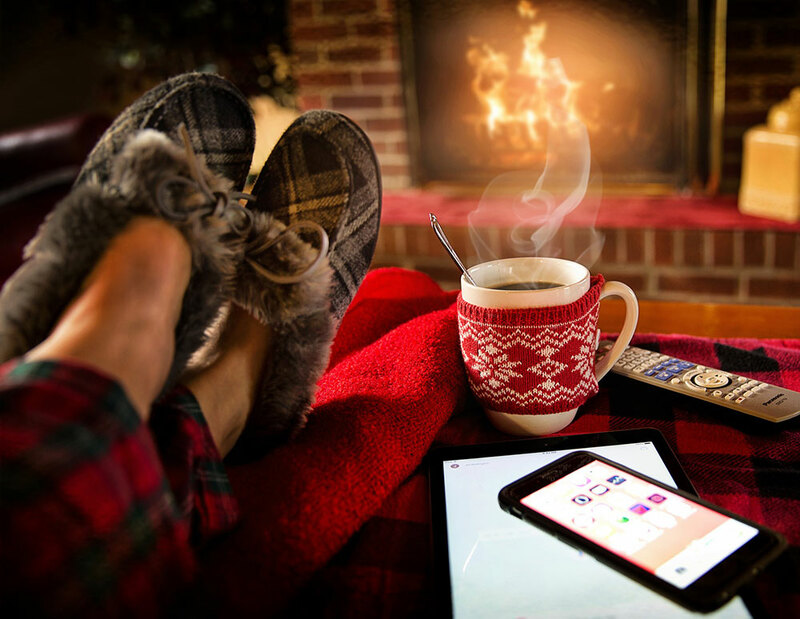 By installing a programmable thermostat, it’s estimated that you can save up to 10 percent a year on both heating and cooling costs. During the winter, program your thermostat to 68 degrees and lower for when you are asleep. When it comes to greenhouse gas emissions, the meat industry is one of the major contributors. The meat and dairy industries also are responsible for using land to farm and feed livestock, as well as massive amounts of water. As a matter of fact, watercalculator.com alerts us to the reality of the water footprint. They state that 6 ounces of beef steak uses up 674 gallons of water, while a salad only uses 21 gallons. Remember, that in order to feed the cow, you have to plant and water the grains, plus provide water to the animals, and use water for any cleanup of supplies. An article in Time found that those who eliminated meat from their diet, replacing it with healthy plant-based proteins, fruits, grains, and vegetables not only had a healthier diet, but also saved up to $750 per year in food costs. If you’re concerned about protein intake, don’t be. Today, there are many vegan and vegetarian athletes in the world, including world-class bodybuilders. So, when you have a meat-free Monday, or better yet, become a vegetarian or vegan, you’re not only creating a healthier you, but you’re saving money and your children’s future as well. For an in depth account of how a couple saved up enough money being plant-based to visit Greece, check out this article in cnbc.com. So far, we’ve seen how going green can not only benefit the planet, but save you a huge chunk of change, and a big part of being green is using your car or truck a little less or more efficiently. There’s a lot going into this topic, so we’ll start right where the rubber meets the road: your tires. Ensure that your tires are fresh, healthy, inflated properly and rotated on a regular basis. Also, Consumer Reports collaborated on a study with Michigan State University, and found that using low-roll resistance tires can save you up to $78 a year on fuel costs. Finally, there are a few common sense approaches you can take regarding transportation which can save you some big bucks in the long run, such as using public transportation or ride sharing. Also, if you think that turning your car on and off uses more fuel than idling the engine, then you’re mistaken, as your car uses more fuel to idle. If you’re into the urban lifestyle, save money commuting on smaller trips to using a personal transportation vehicle, such as an electric scooter, bike, or skateboard. Lastly, if you elect to use your vehicle on a consistent basis, remember to take it in for regular, routine maintenance checks. This ensures your vehicle will run smoothly and efficiently. It’s no secret that purchasing groceries is one of the most expensive things we do for ourselves. In order to cut down on that expense, you can either frequent farmers markets, or better yet, grow it yourself. If you don’t have a green thumb, or are hesitant to begin, stick with the easy to grow, tried and true produce, such as tomatoes, squash, melons, green beans and bell peppers, as these can basically take care of themselves. If you have room, it can’t hurt to add an apple or nut tree into the mix! Now that we’ve got your attention, you’re going to love this next part: growing produce from scraps. 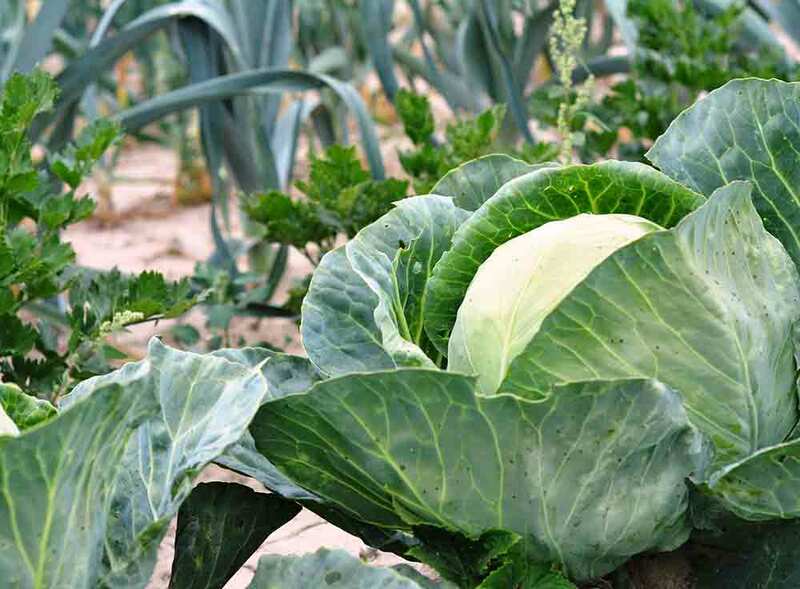 That’s right, there are currently people who have been eating on the same cabbage for many months, by simply planting cabbages, and cutting off what they need when they need, and giving the cabbage time to grow again. 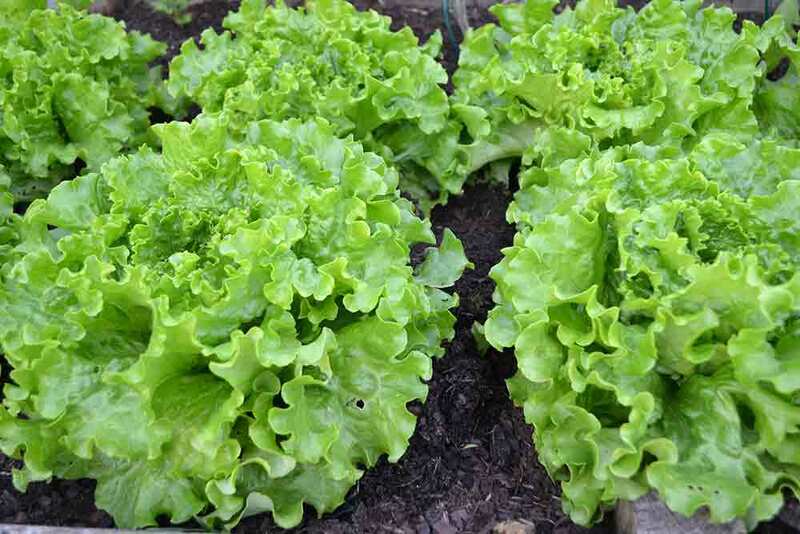 Other produce which is easy to grow from scraps include: lettuce varieties, onions, garlic, and root vegetables. Don’t fret if you don’t have a yard, as many people are experimenting with year long indoor gardens as well as having terrace gardens. Finally, remember to chop and freeze your vegetables, so they can be available during the winter months. 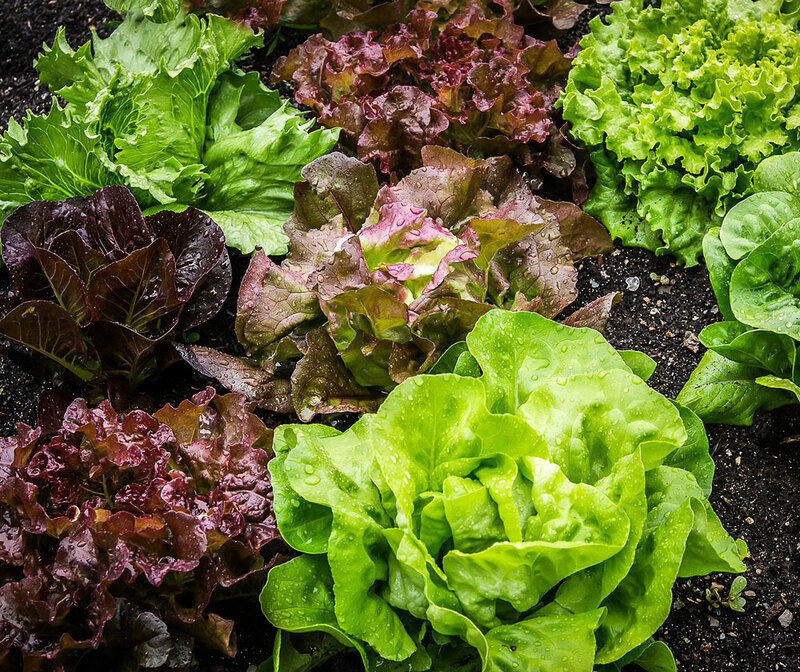 With all of these money-saving, home grown vegetables, it may be a good idea to skip on the expensive, store-bought fertilizers and create your very own compost. You can craft a compost bin yourself, or purchase one. When you compost, you’re taking your left over produce scraps, and garden waste such as grass clippings, and turning them into fertilizer. 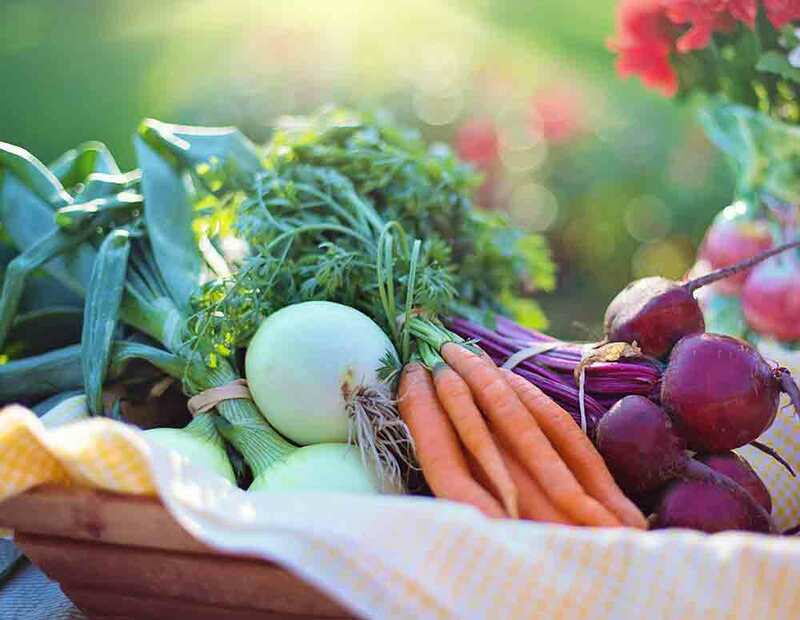 Now, when you look at growing and freezing your own produce, creating your own compost, and reducing the meat in your diet, you have most definitely created a grocery budget you can live with! When an appliance has the ENERGY STAR certification, it means that they’ve been certified by the U.S. Department of Energy, and designed to use up less energy than past models. While they can cost a bit more initially, ENERGY STAR certified appliance will save you some serious money in the long run if used properly. For instance, an ENERGY STAR certified washing machine will use around 25 percent less energy than those which are not certified, and a dryer up to 20 percent less energy. The top appliances which you should look out for are clothes washers and dryers, refrigerators and dishwashers. Our electronics provide us with much in the way of usefulness and entertainment. The problem is, many of our electronic items become obsolete quickly and are discarded. You can help save money for yourself as well as go green for the planet by unloading them to sites such as Gazelle and NextWorth. For more information on how to recycle your previously used electronics, visit the EPA’s site here. Recycling is not only environmentally friendly, but can also save you money. For instance, if you have a pair of jeans that have seen better days, just cut off the legs and turn them into shorts or a carry all bag. 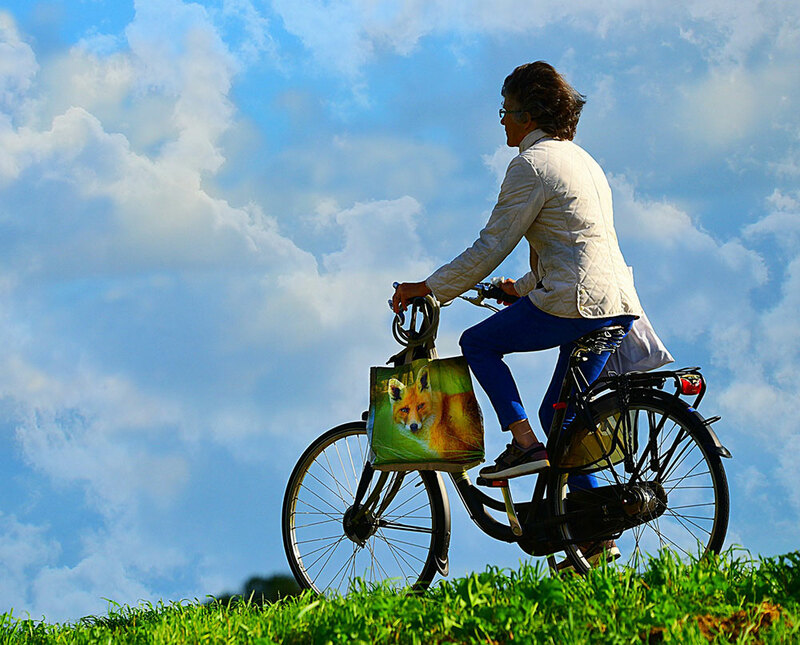 When you join groups such as freecycle.org, you can save huge sums by taking items off of other members, free of charge. By going green when it comes to household chores, you can save yourself some dime at the grocery store by eliminating paper towels and making your own ‘green’ household cleaners. For example, by halting the purchase of paper towels in lieu of microfiber towels you can cross another item off your grocery list. Microfiber towels are very inexpensive, and can be found online and in dollar stores everywhere. A stack of these tough, absorbent, and durable towels are capable of doing everything from sopping up spills and washing your car to drying the family pooch after a bath. Indeed, the amount of money you’ll save phasing out paper towels from your kitchen duties and subbing them with microfiber towels can really add up. Unless you purchase a household cleaner that is marked as sustainable, you are not only spending extra money, but also hurting our environment. 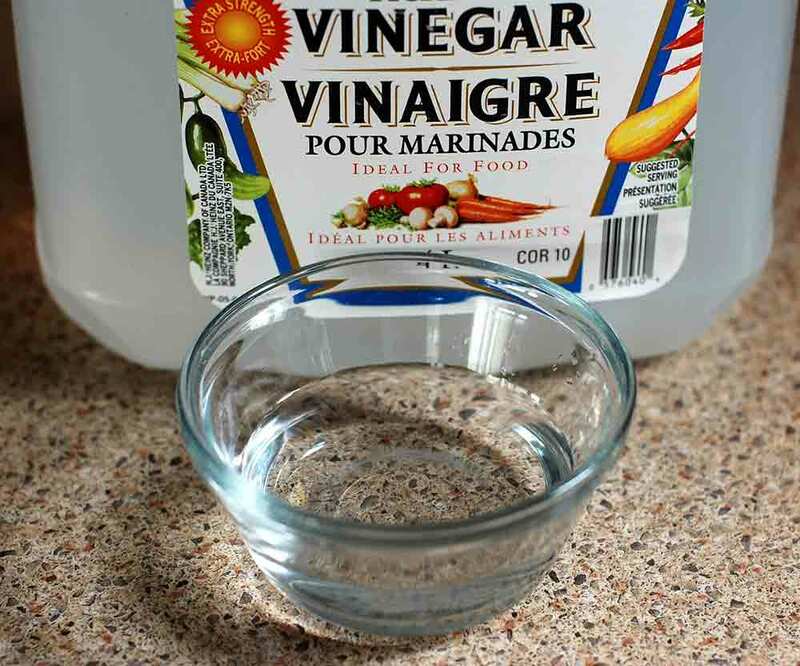 When you make your own household cleaners, such as white vinegar and baking soda, you’ll not only save big, but be saving the environment as well. Contact a professional to perform an energy audit on your home or business. While you do have to pay for a professional to come and check out your environment, their findings will help you save much in the way of unnecessary energy expenses in the long run. These professionals will look into what generates energy, as well as the type of behaviors you’re engaged in that are causing you extra cash. Once they provide you with your energy score, you’ll be advised on how you can improve your score. For more information on how to perform your own energy audit for free, check out the recommendations at energy.gov for more information. When it comes right down to it, going green can definitely save you a good amount of money. 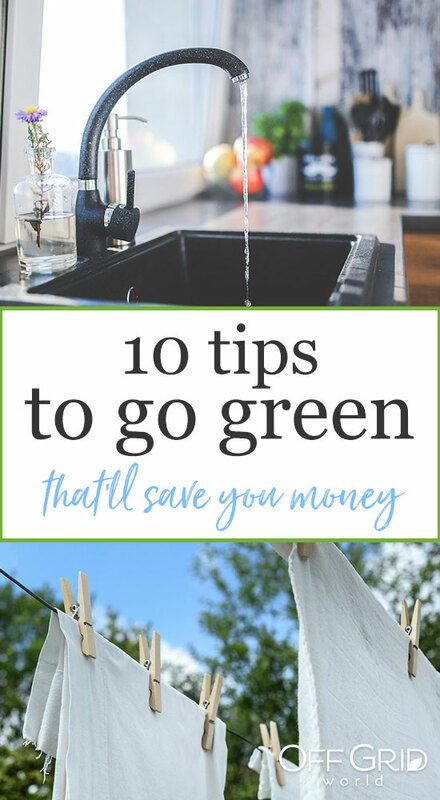 Whether you’re doing it for the planet or for your pocketbook, by doing simple things such as weather stripping your home, purchasing low-flow water fixtures, growing your own produce, cutting down on transportation expenses, you can help yourself out considerably. It’s also recommended that you look into how to perform your own energy audit, or better yet, hire a professional to give you a score to you know where you stand. A significant part of off-grid living is producing a wide variety of food that will add to, and satisfy, your meal planning. With spring approaching, you should already be planning your garden for the coming growing season. It’s the perfect time to decide what changes to make from the last season. Producing an abundance of food involves knowing what kind of plants will grow well in your area. 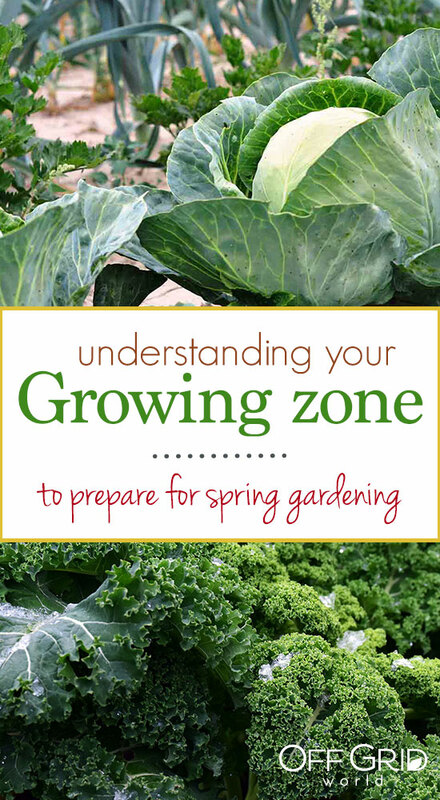 You can do this by understanding your growing zone to prepare for spring gardening this year. The first step to understanding your growing zone is to research the conditions in your area. 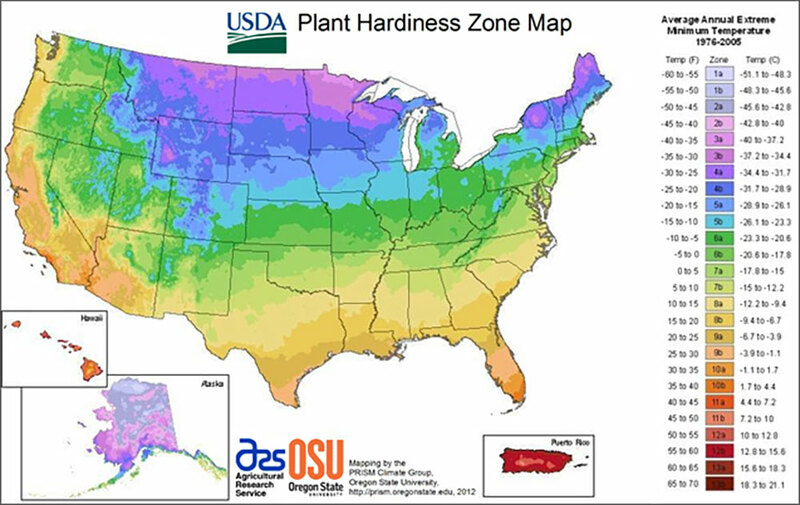 A handy tool is the USDA Plant Hardiness Zone Map. This map will help you identify your zone’s number as well as a letter that designates what plants will thrive in your area. Growing zones are not equally divided on the map. Some transitional areas where two growing zones meet can offer varying conditions. There are also spots around the country that include micro-climates. Someone living on a mountaintop or in a valley may have an entirely different zone designation than surrounding areas. Growing zones depend on climate as well as your surroundings. Nearby bodies of water or mountains can drastically affect your zone. 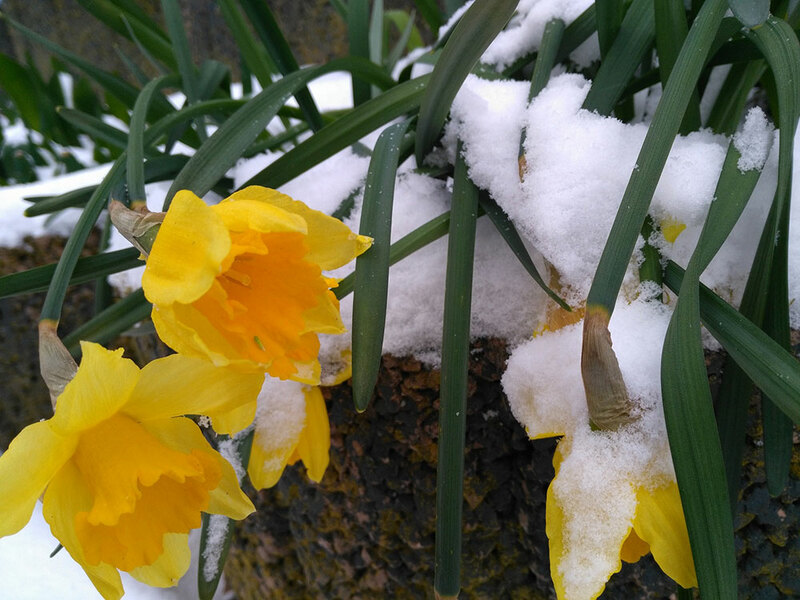 If your off-grid home is a mountain cabin that gets a good deal of snow, don’t rule out planting a winter garden. Onions and shallots can handle a harsh winter. Garlic, broad beans, and asparagus will grow year-round with several harvest dates. Some varieties of spinach will provide you with enough to harvest over the winter and early spring. Pak choi is also an excellent winter crop. This Asian vegetable is an excellent choice for winter salads. The succulent stems also go well in a stir-fried dish in the spring. Keep in mind; these winter vegetables don’t always survive in an area with scorching heat and constant summer sun. Once again, it’s crucial to know your growing zone. You are the best source of information when it comes to the typical weather conditions in your area. The long term forecast may help, but you’re the expert on what to expect during certain months of the year. If you’ve had a mild winter, you may be comfortable starting to prepare your garden earlier in the spring than you have in previous years. 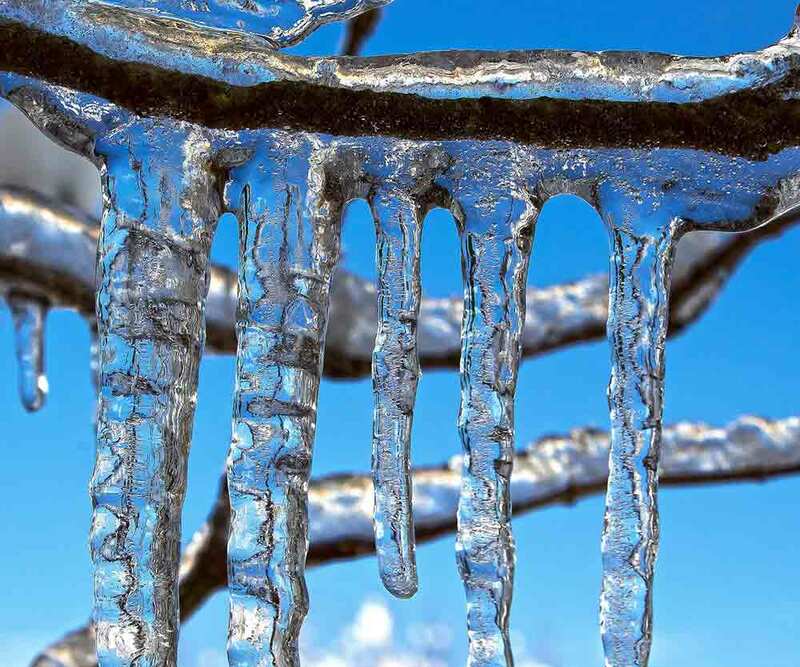 However, if your winter has been quite cold, you may want to hold off a little longer, so you don’t lose an entire crop to frost. Taking note of the past seasons is essential when planning for spring planting. 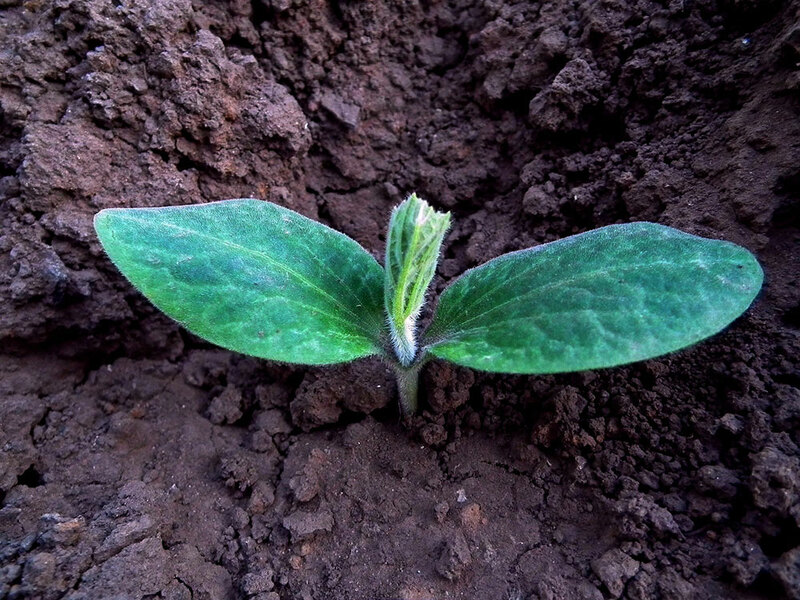 Your growing zone will have specific dates by which the last frost usually occurs in the spring. This date is essential to maximize your growing time and produce a bountiful harvest. Off-grid residents in the south will experience much earlier final frost dates than those in the north. Some southern gardeners may live in an area where frost isn’t a problem, making it possible for them to plant year-round. You also need to anticipate the first frost date of the fall. Counting the days between your last frost date in the spring and the first frost date in the fall will give you an idea of the length of your growing season. Some plants require more than 90 days to mature. This doesn’t rule them out; it just means you’ll have to start the seedlings in indoor planters. Since those frost dates are merely estimates, you need to prepare yourself for a sudden drop in temperatures. Even the best forecaster needs to check the thermometer at night to get an idea of when it’s safe to plant. Once you’ve sown seeds, continue to monitor temperature changes that could rapidly occur with spring thunderstorms. Make sure you keep the seeds and young plants warm if the temperature drops below freezing. Consider covering these areas overnight, to maintain a warm temperature for the soil as well as the plants. Cool season vegetables thrive in the spring and take advantage of the cooler temperatures that cool mornings and nights can bring. These types of plants include peas, broccoli, lettuce, beets, and beans. As long as you plant these after the first frost, you’ll reap the benefits by the end of spring. 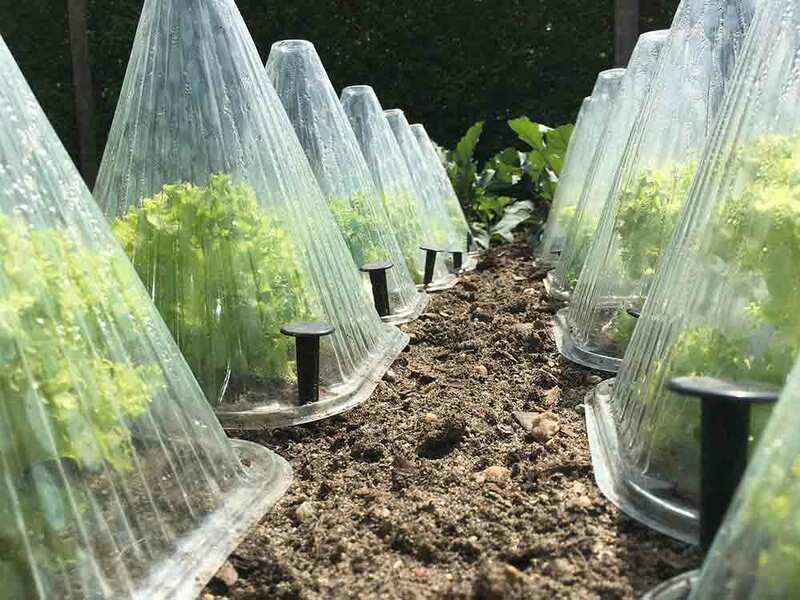 Many off-grid gardeners choose to begin warm season plants by starting seeds in a greenhouse or windowsill. This works well with tomatoes, melons, and vine vegetables like cucumbers that need a little more time to mature. You can then transplant these sun-loving plants in the latter part of the spring once the ground has warmed. Many growing areas will see a short, cool season in the early spring followed by a longer warmer season during summer and then another short, cooler season in the fall. Save the seeds from cool-season plants and plant them in the fall. This will extend your growing season for a few more months and produce enough seeds to replant the following spring. Understanding your growing zone will help you reap the maximum benefit from your vegetable garden. Living off the grid means being eco-friendly and using fewer resources. You can do this by also saving the seeds of your warm season fruits and vegetables. You’ll need to dry them out and place them in a container for storage. You won’t be able to use these seeds until the following summer, but it’s an excellent way to save money and keep the variety in your garden. Eating freshly harvested food without additives or pesticides is just one of the many benefits of living off the grid. However, the independent lifestyle we enjoy comes with a responsibility to work with Mother Nature. Understanding how your soil responds to different weather conditions will help you reap a bountiful supply of produce to last throughout the year. Consider all of these tips when understanding your growing zone to prepare for spring gardening. 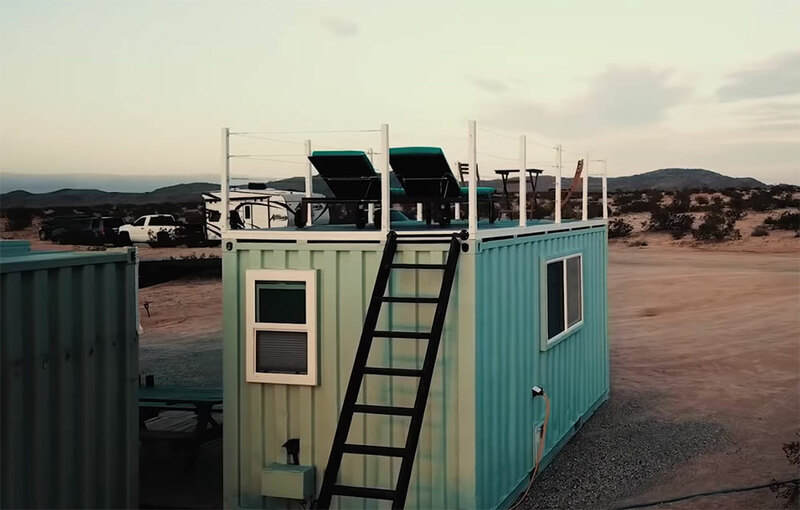 In the high desert of Joshua Tree, California, ‘The Haven’, a cozy shipping container home with a rooftop deck, sits completely off the grid on 5 acres. 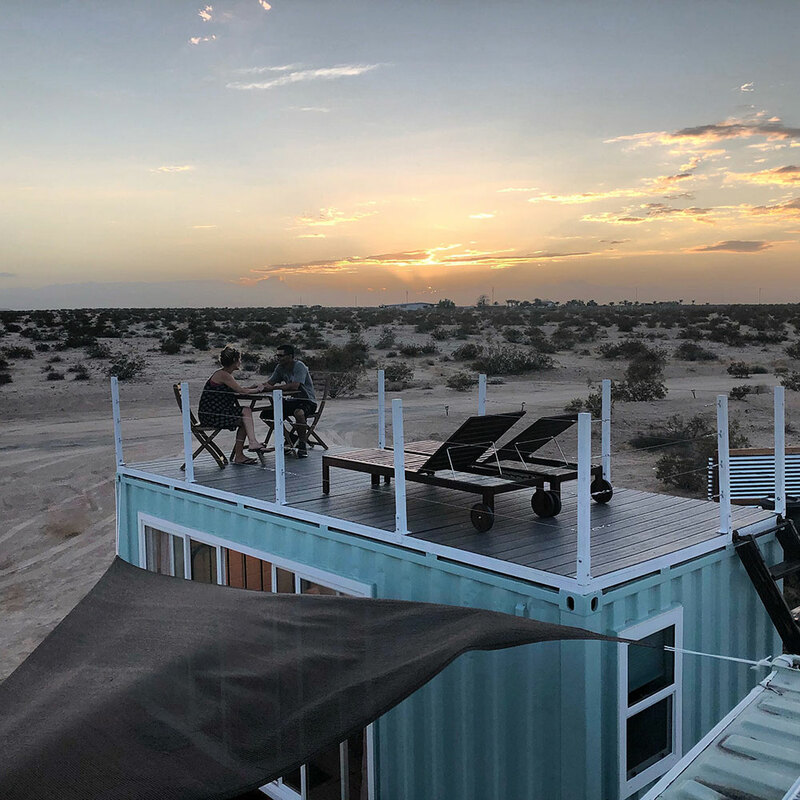 When deciding which type of home to build on their land, owners Aram and Elisabeth decided a shipping container home would best suit the quirky culture around Joshua Tree National Park. 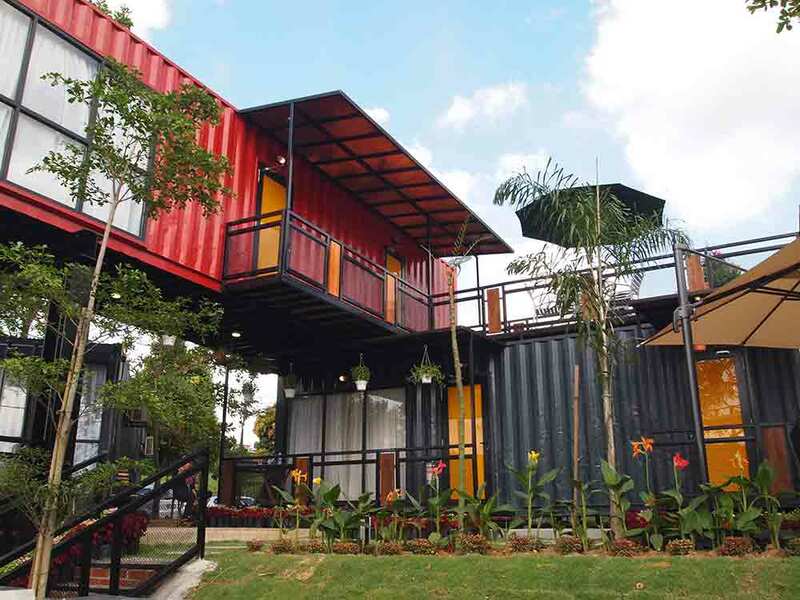 The home was built by Alternative Living Spaces in collaboration with Container Guys Intl. Its remote location, accessed by a long drive down a dirt road, necessitates off grid living. 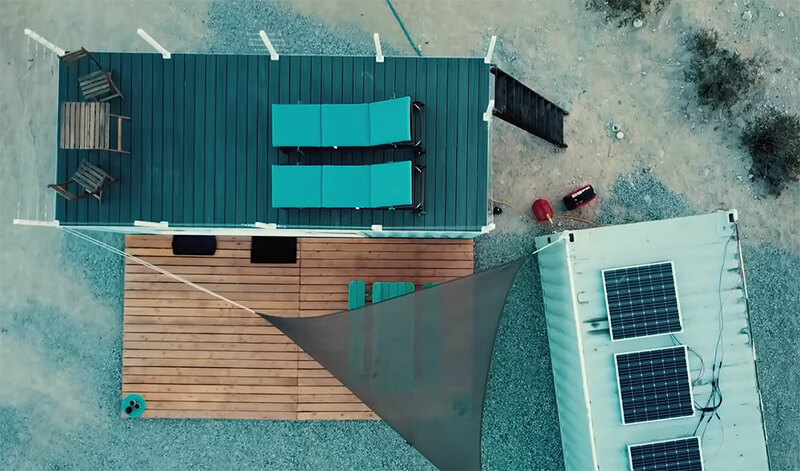 This project demonstrates that living off the grid in a climate with less-than-ideal conditions is not only possible, but can be stylishly comfortable. 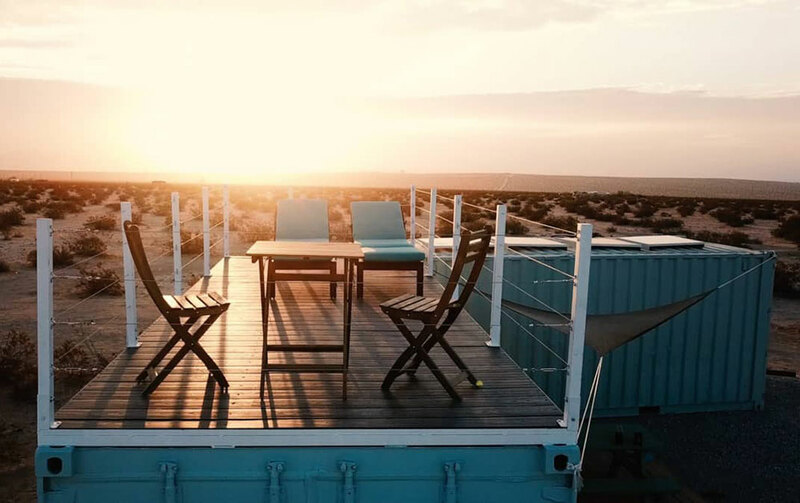 We featured one of Alternative Living Spaces’ luxury shipping container homes in a previous article, and it has remained one of our favorite container home builds to date. The Haven is another beautiful example of luxury living in a tiny space. 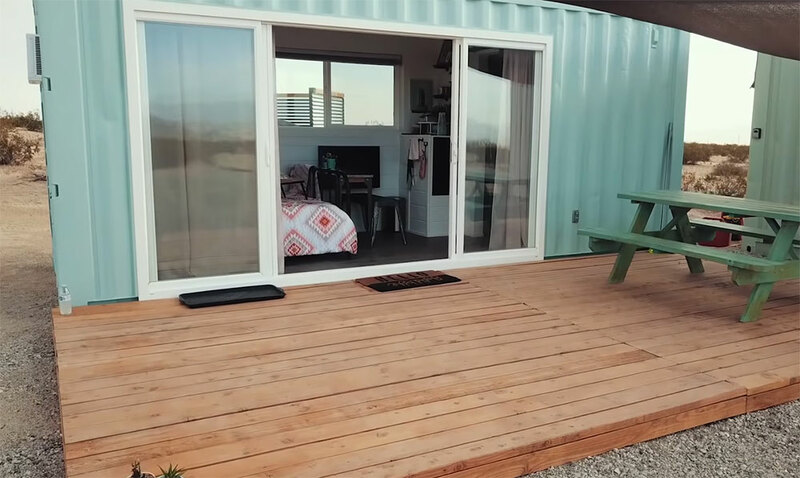 This home is built from a 20 foot used shipping container, for a total of 143 square feet of indoor living space. It includes a rooftop deck, bathroom, bedroom, small kitchen area, and patio. The 12 foot sliding glass doors brighten the interior and open up to the spacious, partially-covered patio deck. 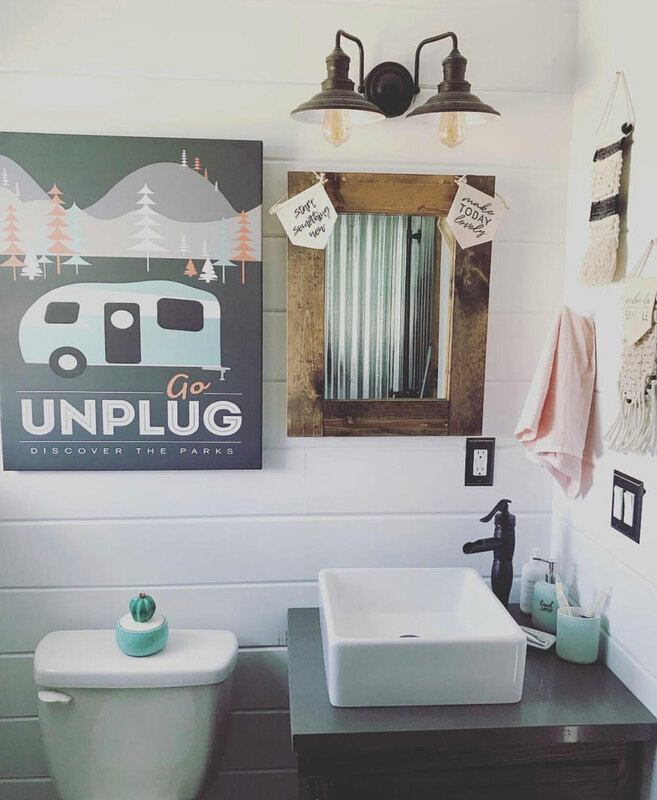 The interior features shiplap walls, bronze fixtures, a barn door leading to the bathroom, and a small kitchen and seating area with a granite countertop. 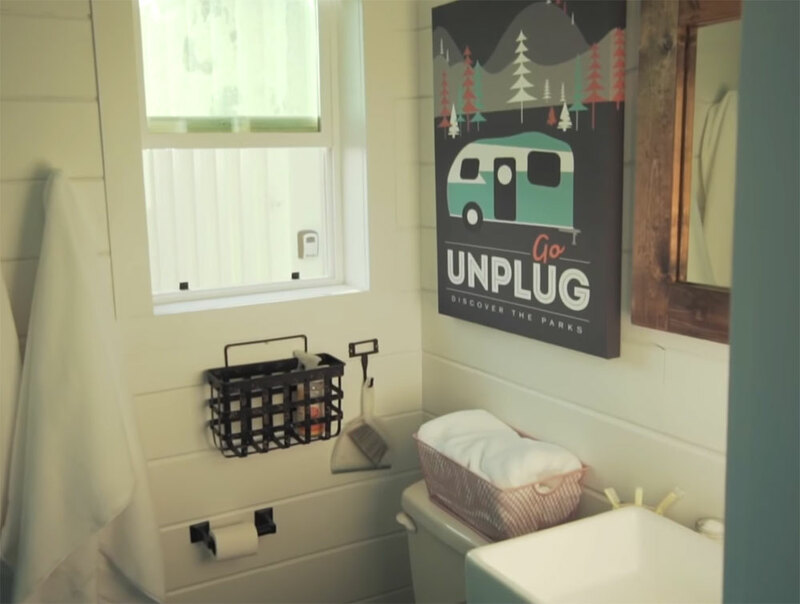 The full bathroom holds a corrugated steel shower, toilet, and vanity with a mirror. A septic system on the property handles the wastewater. 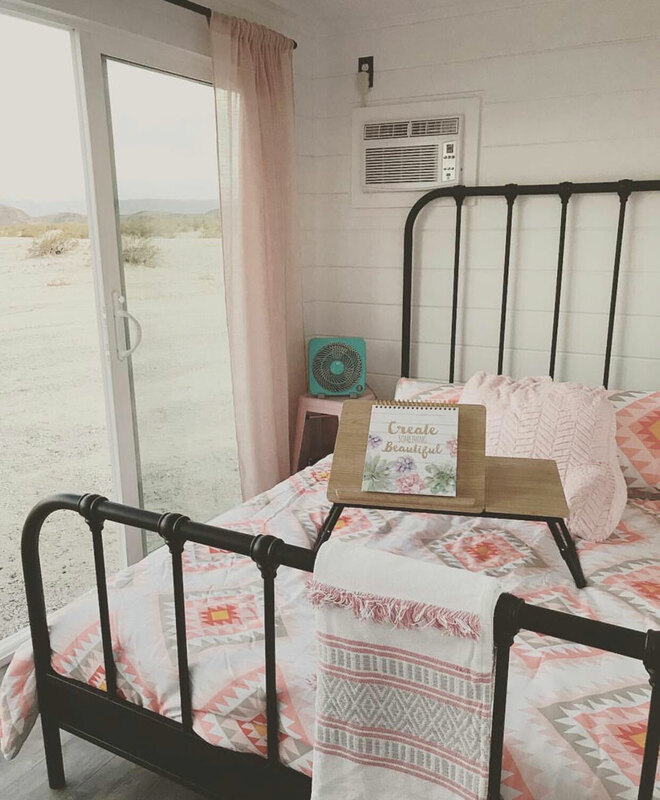 The rooftop deck, accessed by a ladder, is enclosed by cable fence rails and gives the family a place to enjoy the incredible views of the night sky – a perk that Joshua Tree Park is well-known for. The rooftop and the ground-level deck offer plenty of outdoor living space to complement the home. Because their property is surrounded by nature preserves, Aram and Elisabeth chose to leave as small a footprint as possible for their living space. Instead of digging a well, they haul water in to a large holding tank, from which a pump feeds the water to the house. 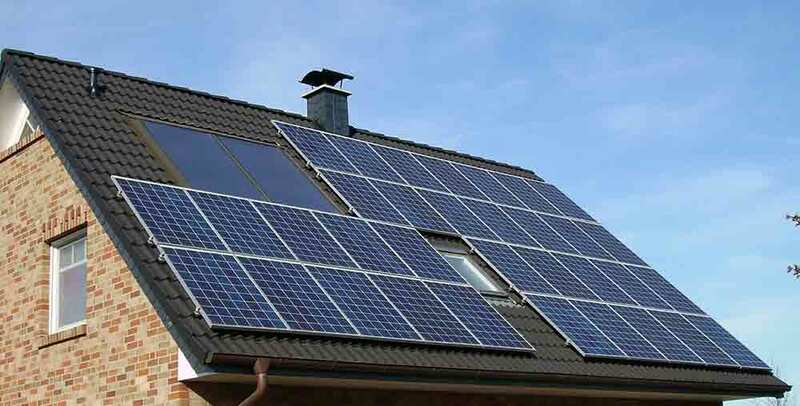 Solar panels power the home, including the lights and an air conditioner to offset the intense summer heat. A fireplace heats the home when nights get cold. A second shipping container serves as the family’s storage space and holds the three panels in the solar array. This residence is ideal for full time off grid living, a getaway home in the mountains (or desert! ), or as an Airbnb rental. See the video below for a tour of the home and an interview with the builders and owners.